Cleansers Toners: Andalou, Sibu Beauty, Derma E, Logona, Earth Science! 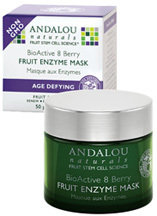 • Age Defying BioActive 8 Berry Fruite Enzyme Mask: Fruit Stem Cells, BioActive 8 Berry Complex, and Resveratrol Q10 provide a potent selection of antioxidants to slow cellular damage and invigorate skin firming collagen and elastin. Fruit juice enzymes gently dissolve dull, dry surface cells to expose skin's vitality and ageless beauty. For Dry & Sensitive Skin. 1.7 oz. ORDER NOW! Ingredients: Vaccinium Macrocarpon (Cranberry), Aloe Barbadensis and Pyrus Malus (Apple) Juices, Helianthus Annuus (Sunflower) Oil, Vegetable Glycerin, Pectin, Cyamopsis Tetragonolobus (Guar) Gum, Citrus Medica Limonum (Lemon) and Saccharum Officinarum (Sugar Cane) Extracts, Fruit Stem Cells (Malus Domestsica, Solar Vitis) and BioActive 8 Berry Complex, Hippophae Rhamnoides (Sea Buckthorn), Rosa Canina (Rosehip) and Limnanthes Alba (Meadowfoam) Oils, Manuka Honey, Papain, Tocopherol (Vitamin E), Resveratrol, Ubiquinone (CoQ10), Lecithin, Camellia Sinensis (White Tea), Hibiscus Sabdariffa and Aspalathus Linearis (Rooibos) Extracts, Phenethyl Alcohol, Ethylhexylglycerin, Citrus Aurantium Dulcis (Orange) Oil. • Brightening Pumpkin Honey Glycolic Mask: Pumpkin Honey Glycolic Mask is blended with organic Pumpkin, rich in beta carotene, Manuka Honey and Citrus Glycolic AHA helps gently dissolve, exfoliate and resurface dull surface cells for smooth tone and texture. Fruit Stem Cell Complex helps invigorate for a brighter, more radiant complexion. 1.7 oz. ORDER NOW! Ingredients: Cucurbita Pepo (Pumpkin) Puree, Aloe Barbadensis Juice, Helianthus Annuus (Sunflower) Oil, Vegetable Glycerin, Manuka Honey, Ananas Sativus (Pineapple) Juice, Pectin, Glycolic Acid, Sodium Hyaluronate, Cyamopsis Tetragonolobus (Guar) Gum, Fruit Stem Cells (Malus Domestsica, Solar Vitis) and BioActive 8 Berry Complex, Lecithin, Saccharum Officinarum (Sugar Cane) Extract, Calophyllum Tacamahaca (Tamanu) and Limnanthes Alba (Meadowfoam) Oils, Magnesium Ascorbyl Phosphate (Vitamin C), Tocopherol (Vitamin E), Aspalathus Linearis (Rooibos) Extract, Phenethyl Alcohol, Ethylhexylglycerin, Cinnamomum Cassia (Cinnamon), Myristica Fragrans (Nutmeg) and Eugenia Caryophyllus (Clove) Powders. • Clarifying Lemon Sugar Facial Scrub: Lemon Sugar Facial Scrub is formulated with Fruit Stem Cell Complex, Vitamin C, Manuka Honey and organic Cane Sugar gently exfoliates impurities for smooth tone and texture. Meyer Lemon helps refreshes and rejuvenates for a bright, healthy complexion. For Active & Oily Skin. 1.7 oz. ORDER NOW! Ingredients: Saccharum Officinarum (Sugar Cane), Helianthus Annuus (Sunflower) Oil, Aloe Barbadensis Juice, Cocos Nucifera (Coconut) and Olea Europaea (Olive) Oils, Oleic Acid, Manuka Honey, Fruit Stem Cells (Malus Domestsica, Solar Vitis) and BioActive 8 Berry Complex, Bambusa Vulgaris (Bamboo) and Citrus Hystrix (Kaffir Lime) Extracts, Curcuma Longa (Turmeric) and Salix Alba (Willow Bark) Extracts, Cetearyl Glucoside, Cetearyl Alcohol, Cyamopsis Tetragonolobus (Guar) Gum, Magnesium Ascorbyl Phosphate (Vitamin C), Camellia Sinensis (White Tea) Extract, Phenethyl Alcohol, Ethylhexylglycerin, Cananga Odorata (YlangYlang) Oil, Styrax Benzoin, Citrus Medica Limonum (Lemon) Oil. • Age Defying Apricot Probiotic Cleansing Milk: Apricot Probiotic Cleansing Milk is formulated with Fruit Stem Cell Complex and probiotic Microflora to soothe irritation and invigorate cell turnover for improved skin protection. Nurturing Aloe Vera, Apricot and Borage oils help gently loosen and remove make-up and impurities, and replenishing intracellular moisture and a healthy glow. For clean, revitalized skin and a refreshed complexion. For Dry & Sensitive Skin. 6 oz. ORDER NOW! Ingredients: Aloe Barbadensis Juice, Helianthus Annuus (Sunflower) Oil, Vegetable Glycerin, Caprylic/Capric Triglycerides, Prunus Armeniaca (Apricot) Oil, Prunus Dulcis (Almond) Milk, Glyceryl Monolaurate, Glyceryl Stearate, Cetyl Alcohol, Prunus Amygdalus Dulcis (Sweet Almond) Oil, Probiotic Complex (Alpha-Glucan Oligosaccharide, Polymnia Sonchifolia Root, Maltodextrin and Lactobacillus), Fruit Stem Cells (Malus Domestsica, Solar Vitis) and BioActive 8 Berry Complex, Resveratrol, Ubiquinone (CoQ10), Vitis Vinifera (Grape Seed) Polyphenols, Allantoin, Tocopherol (Vitamin E), Mangifera Indica (Mango) Butter, Hibiscus Sabdariffa Extract, Rosa Canina (Rosehip) and Borago Officinalis (Borage) Oils, Phenethyl Alcohol, Ethylhexylglycerin, Agathosma Capensis (Buchu) Oil, Citrus Aurantium Dulcis (Orange) Oil. • Brightening Meyer Lemon Creamy Cleanser: Meyer Lemon Creamy Cleanser is blended with Fruit Stem Cell Complex and Manuka Honey, rich in enzymes and antioxidants, gently diffuse into a velvety lather of creamy emollients to exfoliate impurities. Refreshing Meyer Lemon and Vitamin C helps invigorate circulation for improved clarity, tone, and texture. For renewed, clean skin, and a glowing complexion. For Normal & Combination Skin. 6 oz. ORDER NOW! Ingredients:Aloe Barbadensis Juice, Helianthus Annuus (Sunflower) Oil, Vegetable Glycerin, Caprylic/Capric Triglycerides, Prunus Armeniaca (Apricot) Oil, Prunus Dulcis (Almond) Milk, Glyceryl Monolaurate, Glyceryl Stearate, Cetyl Alcohol, Malus Domestica (Apple), Solar Vitis (Grape) and Vaccinium Myrtillus (Bilberry) Fruit Stem Cell Cultures and BioActive 8 Berry Complex, Prunus Amygdalus Dulcis (Sweet Almond) Oil, Probiotic Complex (Alpha-Glucan Oligosaccharide, Polymnia Sonchifolia Root, Maltodextrin and Lactobacillus), Magnesium Ascorbyl Phosphate (Vitamin C), Vitis Vinifera (Grape Seed) Polyphenols, Ubiquinone (CoQ 10), Allantoin, Tocopherol (Vitamin E), Mangifera Indica (Mango) Butter, Hibiscus Rosa-Sinensis Extract, Rosa Canina (Rosehip) and Borago Officinalis (Borage) Oils, Phenoxyethanol, Ethylhexylglycerin, Agathosma Capensis (Buchu) Oil, Citrus Aurantium Dulcis (Orange) Oil. • Clarifying Citrus Kombucha Cleansing Gel: Citrus Kombucha Cleansing Gel is made with Fruit Stem Cell Complex and Citrus Kombucha, rich in skin friendly probiotics and aminos, help nourish beneficial microflora. Blended with clarifying Willow Bark and Aloe Vera gently foam to remove excess oil, retaining a healthy moisture barrier for clean, clear skin. Gentle and non-drying, for a healthy complexion. For Active & Oily Skin. 6 oz. ORDER NOW! Ingredients: Aloe Barbadensis Juice, Decyl Glucoside, Sodium Methyl Cocoyl Taurate, Vegetable Glycerin, Sodium PCA, Saccharum Officinarum (Sugar Cane) and Citrus Medica Limonum (Lemon) Juices, Saccharomyces Xylinum (Kombucha) Black Tea Ferment, Fruit Stem Cells (Malus Domestsica, Solar Vitis) and BioActive 8 Berry Complex, Magnesium Ascorbyl Phosphate (Vitamin C), Vitis Vinifera (Grape Seed) Polyphenols, Lippia Citriodora (Verbena) Extract, Salix Alba (Willow Bark) Extract, Citric Acid, Tocopherol (Vitamin E), Aspalathus Linearis (Rooibos) Extract, Allantoin, Sodium Benzoate, Potassium Sorbate, Ethylhexylglycerin, Cymbopogon Flexuosus (Lemongrass) Oil, Citrus Aurantifolia (Lime) Oil. • Age Defying Blossom & Leaf Toning Refresher: Blossom & Leaf Toning Refresher is formulated with Fruit Stem Cell Complex, superfruit antioxidants, and Aloe Vera polysaccharides to shield, moisturize, and nurture essential nutrients. Uplifting notes of Geranium and Orange leaf helps rejuvenate for a healthy radiance, calm irritation, and harmonize skin's delicate pH. For Dry & Sensitive Skin. 6 oz. ORDER NOW! Ingredients: Aloe Barbadensis Juice, Panthenol (Pro-Vitamin B5), Tocopherol (Vitamin E), Lauric Acid, Fruit Stem Cells (Malus Domestsica, Solar Vitis) and BioActive 8 Berry Complex, Resveratrol, Ubiquinone (CoQ10), Magnesium Ascorbyl Phosphate (Vitamin C), Aspalathus Linearis (Rooibos), Hibiscus Sabdariffa and Camellia Sinensis (White Tea) Extracts, Phenethyl Alcohol, Ethylhexylglycerin, Citrus Aurantium (Petitgrain) and Geranium Maculatum Oils. • Brightening Clementine + C Illuminating Toner: Clementine + C Illuminating Toner is made with Fruit Stem Cell Complex, superfruit antioxidants, and Vitamin C, work as powerful cell energizers to help target hyperpigmentation and UV damage, conditioning skin tone and texture. Aloe Vera effectively moisturizes and oxygenates, balancing pH, and invigorating circulation for healthy glow. For Normal & Combination Skin. 6 oz. ORDER NOW! Ingredients: Aloe Barbadensis Juice, Panthenol (Pro-Vitamin B5), Tocopherol (Vitamin E), Lauric Acid, Fruit Stem Cells (Malus Domestsica, Solar Vitis) and BioActive 8 Berry Complex, Magnesium Ascorbyl Phosphate (Vitamin C), Citrus Clementina (Clementine) and Cucumis Melo (Melon) Extracts, Glycolic Acid, Aspalathus Linearis (Rooibos), Hibiscus Sabdariffa and Camellia Sinensis (White Tea) Extracts, Phenethyl Alcohol, Ethylhexylglycerin, Citrus Tangerina (Tangerine) and Cymbopogon Martini (Palmarosa) Oils. • Brightening Chia + Omega Radiant Skin Polish: Chia + Omega Radiant Skin Polish is formulated with Fruit Stem Cell Complex, omega-rich emollients, and micro-polishing Chia Seeds to gently polish and exfoliate dull, dry, flaky skin. Invigorating healthy cell turnover for enhanced hydration and smooth texture with fewer lines and wrinkles, skin appears younger and renewed with a healthy glow. For Normal and Combination Skin. 2 oz. ORDER NOW! Ingredients: Aloe Barbadensis Juice, Simmondsia Chinensis (Jojoba) and Borago Officinalis (Borage) Oils, Cetearyl Alcohol, Salvia Hispanica (Chia) Seed Powder, Linum Usitatissimum (Flax) Oil, Fruit Stem Cells (Malus Domestsica, Solar Vitis) and BioActive 8 Berry Complex,Cyamopsis Tetragonolobus (Guar) Gum, Juglans Regia (Walnut) Powder, Magnesium Ascorbyl Phosphate (Vitamin C), Curcuma Longa (Turmeric) Extract, Camellia Sinensis (White Tea) Extract, Phenethyl Alcohol, Ethylhexylglycerin, Agathosma Capensis (Buchu) Oil, Citrus Aurantium Dulcis (Orange) Oil. • Brightening Lash & Lid Make-up Remover: Lash & Lid Make-up Remover with Fruit Stem Cell Complex strengthens and conditions lashes, lids and brows lashes. Fortifies for longer, fuller lashes and extends full lash growth potential. Gently cleans delicate eye area and enhances beautiful shaped brows. Gentle botanical emollients gently loosen and remove all types of facial make-up, including water resistant formulas, without irritation or oily residue. 6 oz. ORDER NOW! • Sensitive 1000 Roses Rosewater Mask: This revitalizing 1000 Roses Rosewater Mask with Alpine Rose Stem Cells help deliver moisture and cellular support to calm, nurture, and transform sensitive skin. Blended with Pomegranate to tone and tighten the skin, Hyaluronic Acid and Aloe Vera helps invigorate skin's moisture barrier for a naturally flawless complexion. Dermatologist Tested. For Delicate & Dry Skin. 1.7 oz. ORDER NOW! Ingredients: Aloe Barbadensis Juice, Rosa Damascena (Rose) Distillate, Vaccinium Macrocarpon (Cranberry) Juice, Vegetable Glycerin, Pectin, Cyamopsis Tetragonolobus (Guar) Gum, Rosa Canina (Rosehip) and Punica Granatum (Pomegranate) Oils, Allantoin, PhytoCellTec (Alpine Rose, Malus Domestsica, Solar Vitis) and BioActive 8 Berry Complex, Soothing Complex: [Hyaluronic Acid, Magnolia Officinalis Bark, Phoenix Dactylifera (Date) Leaf Cell and Boswellia Serrata (Boswellin) Extracts], Panthenol (Pro-Vitamin B5), Camellia Sinensis (White Tea) and Hibiscus Sabdariffa Extracts, Tocopherol (Vitamin E), Phenethyl Alcohol, Ethylhexylglycerin, Citrus Tangerina (Tangerine) and Pelargonium Graveolens (Rose Geranium) Oils, Rosa Centifolia (Rose) Oil. • Sensitive 1000 Roses Floral Toner: This fragrant rosewater 1000 Roses Floral Toner with Alpine Rose Stem Cells instantly rejuvenates and refreshes skin's delicate pH balance. Pomegranate, rich in tannins and polyphenols, tones and tightens the skin. Blended with moisture-binding humectants, Hyaluronic Acid, and Aloe Vera revitalize skin's hydro lipid barrier for a naturally perfect complexion. For Delicate & Dry Skin. Dermatologist Tested. 6 oz. ORDER NOW! Ingredients: Aloe Barbadensis Juice, Rosa Damascena (Rose) Distillate, Panthenol (Pro-Vitamin B5), Tocopherol (Vitamin E), Lauric Acid, PhytoCellTec (Alpine Rose, Malus Domestsica, Solar Vitis) and BioActive 8 Berry Complex, Soothing Complex: [Hyaluronic Acid, Magnolia Officinalis Bark, Phoenix Dactylifera (Date) Leaf Cell and Boswellia Serrata (Boswellin) Extracts], Punica Granatum (Pomegranate) Extract, Hibiscus Sabdariffa and Camellia Sinensis (White Tea) Extracts, Phenethyl Alcohol, Ethylhexylglycerin, Citrus Tangerina (Tangerine) and Pelargonium Graveolens (Rose Geranium) Oils, Rosa Centifolia (Rose) Oil. • Sensitive 1000 Roses Cleansing Foam: The refreshing rosewater 1000 Roses Cleansing Foam with Alpine Rose Stem Cells gently loosens and removes make-up, impurities, and dull, dry surface cells that can clog pores. Pomegranate, rich in tannins and polyphenols, tones and tightens. Formulated with moisture-binding humectants, Hyaluronic Acid and Aloe Vera to help revitalize skin's hydro lipid barrier. Extra mild for a clean and naturally flawless complexion. For Delicate & Dry Skin. Dermatologist Tested. 5.5 oz. ORDER NOW! Ingredients: Aloe Barbadensis Juice, Rosa Damascena (Rose) Distillate, Decyl Glucoside, Sodium Methyl Cocoyl Taurate, Vegetable Glycerin, Sorbitol, Glyceryl Cocoate, Rosa Canina (Rosehip) and Punica Granatum (Pomegranate) Oils, Allantoin, PhytoCellTec (Alpine Rose, Malus Domestsica, Solar Vitis) and BioActive 8 Berry Complex, Soothing Complex: [Hyaluronic Acid, Magnolia Officinalis Bark, Phoenix Dactylifera (Date) Leaf Cell and Boswellia Serrata (Boswellin) Extracts], Panthenol (Pro-Vitamin B5), Camellia Sinensis (White Tea) and Hibiscus Sabdariffa Extracts, Citric Acid, Tocopherol (Vitamin E), Sodium Benzoate, Potassium Sorbate, Ethylhexylglycerin, Citrus Tangerina (Tangerine) and Pelargonium Graveolens (Rose Geranium) Oils, Rosa Centifolia (Rose) Oil. FACE CARE: Chia + Omega Radiant Skin Polish, 2 oz. 1000 Roses Rosewater Mask, 1.7 oz. Lash & Lid Make-up Remover, 6 oz. • Chamomile Cleansing Creme: Chamomile Cleansing Creme is a calming, extra gentle, fragrance free cleansing crème that clears away daily impurities and makeup with ease. Blended with pure plant extracts, organic Aloe Vera, Chamomile and Calendula to help retain the skin's natural pH moisture balance for perfect support and natural radiance. Helps skin feeling soft, supple, and restfully clean, without any greasy or oily residue left behind. For external use only. 5 oz. ORDER TODAY! Ingredients: Aloe Barbadensis (Aloe Vera Gel), Aqua (Purified Water), Allantoin Extract, Anthemis Nobilis (Chamomile) Flower Extract, Calendula Officinalis (Calendula) Flower Extract, Humulus Lupulus (Hops) Flower Extract, Glycerin (Vegetable), Camellia Sinensis (Japanese Green Tea) Leaf Extract, Capric/Caprylic Triglycerides (Derived From Coconut), Hydrolyzed Wheat Protein Amino Acids, Lecithin Phospholipid, Spirulina Maxima (Spirulina) Extract, Fucus Vesiculosus (Bladderwrack) Extract, Usnea Barbata (Oak Moss) Extract, Vitis Vinifera (Grape) Seed Extract. • Gentle Aloe Facial Scrub: The all natural skin exfoliator Gentle Aloe Facial Scrub helps gently lifts off old, dead, and dry surface cells. Made with the velvetiness of healing Goldenseal and 100% pure, round Jojoba Beads which will not tear the pores of the skin (like salt and sugar scrubs can). Helps improve the look of your skin texture and boost the effectiveness of treatment serums and moisturizers. Leaves skin feeling supple and soft, as the appearance of healthy, new skin turn-over is invigorated. For external use only. 6 oz. ORDER TODAY! Ingredients: Aloe Barbadensis (Certified Organic Aloe Vera Gel), Saponaria Officialis (Soapwort) Extract, Jojoba Esters (Beads), Sorbitol, Simmondsia Chinensis (Jojoba) Seed Oil, Hydrastis Canadensis (Golden Seal) Extract, Sodium Chloride, Allantoin, Vitis Vinifera (Grape) Seed . • Aloe Vera Moisture Cleanser: Aloe Vera Moisture Cleanser helps balance the drying effects of water with essential oils and natural protectants of Jojoba and Vitamin E to recondition skin's balance; clarify and tightens pores. Lightweight, refreshing, non-comedogenic, all natural Aloe Vera Moisture Cleanser is made with essential oils of Rose, Geranium, Chamomile, and Lavender, which remove dirt, dissolving make-up, impurities, and pollutants. Offers rich lather obtained from natural Soapwort extract. It has a revitalizing, light, clean fragrance. 5 oz. ORDER TODAY! Ingredients: Aloe Barbadensis (Certified Organic Aloe Vera Gel), Saponaria Officialis (Soapwort) Extract, Simmondsia Chinensis (Jojoba) Seed Oil, Lecithin Phospholipid, Prunus Serotina (Cherry Bark) Extract, Tropaeolum Majus (Cress) Extract, Prunus Amygdalus Dulcis (Sweet Almond) Oil, Panthenol (Vitamin B5), Capric/Caprylic Triglycerides (Derived From Coconut), Cinchona Calisaya (Cinchona), Pelargonium Graveolens (Geranium) Essential Oil, Rosa Damascena (Rose) Oil, Anthemis Nobilis (Chamomile) Flower Essential Oil, Lavandula Officinalis (Lavender) Essential Oil. • Avocado Oil Creamy Aloe Eye Makeup Remover: The light, silky Creamy Aloe Eye Makeup Remover with Avocado oil helps spread evenly and quickly, and effectively removing all signs of eye makeup. Blended with gentle Aloe and Avocado oil, calming Green Tea helps cover the tender sensitive eye area, and remove normal eye makeup without stinging or tingling. Helps eye area feeling clean, not stripped. For external use only. 1.7 oz. ORDER TODAY! Ingredients: Aloe Barbadensis (Aloe Vera Gel), Aqua (Purified Water), (Allantoin Extract, Anthemis Nobilis (Chamomile) Flower Extract, Calendula Officinalis (Calendula) Flower Extract, Humulus Lupulus (Hops) Extract, Glycerin (Vegetable), Camellia Sinensis (Japanese Green Tea) Leaf Extract, Capric/Caprylic Triglycerides (Derived From Coconut), Butyrospermum Parkii (Shea Butter), Hydrolyzed Wheat Protein Amino Acids, Persea Gratissima (Avocado) Oil, Simmondsia Chinensis (Jojoba) Seed Oil, Caprylic Glutamate, Lecithin Phospholipid, Fucus Vesiculosus (Bladderwrack) Extract, Spirulina Maxima (Spirulina) Extract, Usnea Barbata (Oak Moss) Extract, Vitis Vinifera (Grape) Seed. • Moroccan Rose Facial Toner: Moroccan Rose Facial Toner helps eliminate any residuals left behind after cleansing, control hydration levels and open the skin's receptor sites. Made with naturally active fruit acids to encourage the feeling of smoother, fresher-looking skin, with natural astringents of Rosemary and Sage to reduce the look of pore size. Rosa Centifolia helps soothe and control redness and reactivity, and offering a beautiful, light aroma. 6 oz. ORDER TODAY! Ingredients: Aloe Barbadensis (Certified Organic Aloe Vera Gel), Hamamelis Virginiana Distillate (Witch Hazel) Extract, Lactic Acid (Natural Fruit Acid), Maleic Acid (Natural Fruit Acid), Glycolic Acid (Natural Fruit Acid), Camellia Sinensis (Japanese Green Tea) Leaf Extract, Allantoin, Rosa Centifolia (Rose) Essential Oil, Salvia Officinalis (Sage) Essential Oil, Rosmarinus Officinalis (Rosemary) Essential Oil, Anthemis Nobilis (Chamomile) Flower Essential Oil. Gentle Aloe Facial Scrub | Moroccan Rose Facial Toner. FACE CARE: Creamy Aloe Eye Makeup Remover, 1.7 oz. • Pore Purifying Pineapple Enzyme Facial Scrub: Pineapple Enzyme Facial Scrub is made with pore-pleasing Papaya and Pineapple enzymes work harmoniously to clear out impurities, and gentle buffing granules smooth away dulling debris to reveal glowing skin. Blended with Vitamin E, Aloe and Jojoba to calm and hydrate. Hypo-allergenic. 4 oz. ORDER TODAY! Ingredients: Aqua (Water), Jojoba Esters, Caprylic/Capric Triglyceride, Aminomethyl Propanol, Simmondsia Chinensis (Jojoba) Seed Oil, Aloe Barbadensis Leaf Juice, Ananas Sativus (Pineapple) Fruit Extract, Carica Papaya (Papaya) Fruit, Zingiber Officinale (Ginger) Root Extract, Allantoin, Bromelain, Carbomer, Cetyl Alcohol, Citric Acid, Glycerin, Sodium Riboflavin Phosphate, Stearic Acid, Tocopheryl Acetate, Alcohol, Benzyl Alcohol, Gluconolactone, Potassium Sorbate, Sodium Benzoate, Limonene, Fragrance (Parfum). • Pore-fecting Papaya Enzyme Facial Mask: Experience this five minute tropical retreat Pore-fecting Papaya Enzyme Facial Mask for an instant skin energy. Made with Papaya and Pineapple enzymes gently loosen and dissolve dull skin cells and impurities to reveal fresh, radiant skin. Hypo-allergenic. 2.5 oz. ORDER TODAY! ORDER TODAY! Ingredients: Aqua (Water), Aloe Barbadensis Leaf Juice, Glycerin, Protease, Algin, Carica Papaya (Papaya) Fruit Extract, Polysorbate 20, Ananas Sativus (Pineapple) Fruit Extract, Vanilla Planifolia Fruit Extract, Zingiber Zerumbet Extract, Panthenol, Xanthan Gum, Benzyl Alcohol, Ethylhexylglycerin, Phenoxyethanol, Limonene, Fragrance (Parfum), Chlorophyllin-Copper Complex (CI 75810). • Pore Purifying Pineapple Enzyme Facial Cleanser: The fresh-faced Pore Purifying Pineapple Enzyme Facial Cleanser helps cleanse for replenished and glowing complexion. Pore-refining Pineapple and skin-brightening Papaya enzymes wash away impurities, make-up and dullness. Blended with Aloe, Hibiscus and Passion flower deliver much needed R&R to calm and stabilize the skin. Hypo-allergenic. 8 oz. ORDER TODAY! Ingredients: Aqua (Water), Decyl Glucoside, Cocamidopropyl Hydroxysultaine, Glycerin, Aloe Barbadensis Leaf Juice (1), Ananas Sativus (Pineapple) Fruit Extract (1), Carica Papaya (Papaya) Fruit Extract, Hibiscus Sabdariffa Flower Extract (1), Passiflora Incarnata Flower Extract (1), Guar Hydroxypropyltrimonium, Chloride, Bromelain, Maltodextrin, Panthenol, Sodium PCA, Coco-Glucoside, Glyceryl Oleate, Xanthan Gum, Citric Acid, Alcohol (1), Benzyl Alcohol, Sodium Benzoate, Potassium Sorbate, Benzyl Benzoate, Limonene, Fragrance (Parfum). • Deep Cleansing Coconut Milk Facial Wash: Your skin will look up to this smoothing, miracle Deep Cleansing Coconut Milk Facial Wash. Creamy, luxuriant and ample in natural nutrients, it gently washes away any traces of the day with naturally cleansing Coconut Milk and pore-refining papaya enzymes. Stimulating Ginger and calming Aloe stabilize the skin for a relaxed, clean feel without tightness. Hypo-allergenic. 8 oz. ORDER TODAY! Ingredients: Aqua (Water), C14-22 Alcohol, Stearic Acid, Cetearyl Alcohol, Ethylhexyl Palmitate, Aloe Barbadensis Leaf Juice, Carica Papaya (Papaya) Fruit Extract, Cocos Nucifera (Coconut) Fruit Extract, Zingiber Officinale (Ginger) Root Extract, Cocos Nucifera (Coconut) Oil(1), Helianthus Annuus (Sunflower) Seed Oil, Linum Usitatissimum (Linseed) Seed Oil, Rosa Canina Fruit Oil, Simmondsia Chinensis (Jojoba) Seed Oil, C12-20 Alkyl Glucoside, Cetyl Alcohol, Glycerin, Panthenol, Polysorbate 60, Potassium Hydroxide, Tocopheryl Acetate, Alcohol, Benzoic Acid, Dehydroacetic Acid, Phenoxyethanol, Coumarin, Fragrance (Parfum). • Complexion Balancing Hibiscus Facial Toner: Complexion Balancing Hibiscus Facial Toner is made with soothing, cool Cucumber, Witch Hazel and Aloe Vera to cleanse and reduce pores. Blended with extracts of Hibiscus, Honeysuckle, Passion Flower and Guava to help further purify and invigorate the skin for a smooth, balanced tone. Hypo-allergenic. 8 oz. ORDER TODAY! Ingredients: Aqua (Water), Aloe Barbadensis Leaf Juice, Polysorbate 20, Arnica Montana Flower Extract, Calendula Officinalis Flower Extract, Centella Asiatica Extract, Citrus Grandis (Grapefruit) Seed Extract, Cucumis Sativus (Cucumber) Fruit Extract, Hibiscus Rosa-Sinensis Flower Extract, Hamamelis Virginiana (Witch Hazel) Extract, Lonicera Japonica (Honeysuckle) Flower Extract, Passiflora Incarnata Flower Extract, Psidium Guajava Fruit Extract, Citrus Limon (Lemon) Peel Oil, Citrus Nobilis (Mandarin Orange) Peel Oil, Lavandula Angustifolia (Lavender) Oil, Allantoin, Glycerin, Panthenol, Sodium PCA, Alcohol, Ethylhexylglycerin, Phenoxyethanol, Beta-Pinene, Linalyl Acetate, Linalool. • Even Advanced Deep Sea Facial Mask: This smooth, creamy Deep Sea Facial Mask helps your skin getting a deep down workout while you relax. Combined with the botanically powerful Marine Complex and Kaolin Clay to draw out dulling impurities and promote cell regeneration for a balanced skin tone. Treat yourself for a radiant replenished skin. Hypo-allergenic. 4 oz. ORDER TODAY! Ingredients: Aqua (Water), Glycerin, Glyceryl Stearate SE, Montmorillonite, Kaolin, Cetyl Alcohol, Aloe Barbadensis Leaf Juice, Dimethicone, Titanium Dioxide, Carthamus Tinctorius (Safflower) Seed Oil), Zinc Oxide, Caprylic/Capric Triglyceride, Caesalpinia Spinosa Gum, Carthamus Tinctorious (Safflower) Oleosomes, Chamomilla Recutita (Matricaria) Flower Extract, Chondrus Crispus (Carrageenan) Extract, Enteromorpha Compressa Extract, Laminaria Digitata Extract, Macrocystis Pyrifera Extract, Olea Europaea (Olive) Leaf Extract, Spirulina Maxima Extract, Ulva Lactuca Extract, Butyrospermum Parkii (Shea Butter), Hydrogenated Palm Kernel Oil, Prunus Amygdalus Dulcis (Sweet Almond) Oil, Allantoin, Ascorbic Acid, Ascorbyl Glucoside, Citric Acid, Diacetyl Boldine, Erythritol, Homarine HCl, Panthenol, Tapioca Starch, Tocopheryl Acetate, Xanthan Gum, Alcohol, Benzoic Acid, Dehydroacetic Acid, Phenoxyethanol, Potassium Sorbate, Sodium Benzoate, Benzyl Benzoate, Geraniol, Hexyl Cinnamal, Limonene, Linalool, Fragrance (Parfum), Annatto (CI 75120) . • Even Advanced Sea Algae Enzyme Scrub: This gentle but effective Sea Algae Enzyme Scrub helps fight off dull, dry skin to instantly create a softer, smoother complexion that seems to glow. Infused with botanically powerful Marine Complex and Sea Enzymes helps produce cell regeneration for a balanced skin tone. Hypo-allergenic. 4 oz. ORDER TODAY! Ingredients: Aqua (Water), Jungians Regia (Walnut) Shell Powder, Glyceryl Stearate SE, Dimethicone, Glycerin, Cetyl Alcohol, Helianthus Annuus (Sunflower) Seed Oil, Pumice, Aloe Barbadensis Leaf Juice, Camellia Sinensis Leaf Extract, Chamomilla Recutita (Matricaria) Flower Extract, Chondrus Crispus (Carrageenan) Extract, Citrus Grandis (Grapefruit) Fruit Extract, Enteromorpha Compressa Extract, Gardenia Florida Fruit Extract, Laminaria Digitata Extract, Macrocystis Pyrifera Extract, Spirulina Maxima Extract, Vitis Vinifera (Grape) Seed Powder, Ulva Lactuca Extract, Zea Mays (Corn) Cob Power, Borago Officinalis Seed Oil, Linum Usitatissimum (Linseed) Seed Oil, Rosa Canina Fruit Oil, Simmondsia Chinensis (Jojoba) Seed Oil, Allantoin, Ascorbic Acid, Ascorbyl Glucoside, Caesalpinia Spinosa Gum, Caprylic/Capric Triglycerides, Citric Acid, Diacetyl Boldine, Erythritol, Glyceryl Laurate, Homarine HCL, Sodium PCA, Sodium Stearoyl Glutamate, Stearic Acid, Stearyl Alcohol, Tocopheryl Acetate, Xanthan Gum, Alcohol, Benzoic Acid, Benzyl Alcohol, Dehydroacetic Acid, Ethylhexylglycerin, Phenoxyethanol, Potassium Sorbate, Sodium Benzoate, Benzyl Benzoate, Hexyl Cinnamal, Limonene, Linalool, Fragrance (Parfum). • Even Advanced Sea Lettuce Cleansing Milk: This soap-free Sea Lettuce Cleansing Milk gently removes any traces of the day. Made with botanically powerful Marine Complex, containing Sea Lettuce extract, helps promote cell regeneration to provide a more smooth skin tone. Treat yourself with skin that's clean but never stripped. Hypo-allergenic. 6 oz. ORDER TODAY! Ingredients: Aqua (Water), C14-22 Alcohols, C12-20 Alkyl Glucoside, Aloe Barbadensis Leaf Juice, Camellia Sinensis Leaf Extract, Chamomilla Recutita (Matricaria) Flower Extract, Chondrus Crispus (Carrageenan) Extract, Citrus Grandis (Grapefruit) Fruit Extract, Enteromorpha Compressa Extract, Laminaria Digitata Extract, Macrocystis Pyrifera Extract, Spirulina Maxima Extract, Ulva Lactuca Extract, Cocos Nucifera (Coconut) Oil, Helianthus Annuus (Sunflower) Seed Oil, Linum Usitatissimum (Linseed) Seed Oil, Rosa Canina Fruit Oil, Simmondsia Chinensis (Jojoba) Seed Oil, Ascorbic Acid, Ascorbyl Glucoside, Caesalpinia Spinosa Gum, Caprylic/Capric Triglycerides, Cetearyl Alcohol, Cetyl Alcohol, Citric Acid, Diacetyl Boldine, Erythritol, Glycerin, Homarine HCL, Panthenol, Polysorbate 60, Potassium Hydroxide, Retinyl Palmitate, Stearic Acid, Tocopheryl Acetate, Alcohol, Benzoic Acid, Dehydroacetic Acid, Phenoxyethanol, Potassium Sorbate, Sodium Benzoate, Benzyl Benzoate, Hexyl Cinnamal, Limonene, Linalool, Fragrance (Parfum). • Even Advanced Sea Kelp Facial Toner: Sea Kelp Facial Toner helps maintain balance of the skin, evenly relaxed, and perfectly ready for optimal hydration. Instantly, your skin is balanced. Made with botanically powerful Marine Complex, containing micronized Sea Kelp, helps stabilize pH levels, and invigorate cell regeneration, resulting in a smooth toned complexion. Hypo-allergenic. 6 oz. ORDER TODAY! Ingredients: Aqua (Water), Glycerin, Polysorbate 20, Aloe Barbadensis Leaf Juice, Camilla Sinensis Leaf Extract, Chlorella Pyrenoidosa Extract, Chondrus Crispus (Carrageenan) Extract, Citrus Grandis (Grapefruit) Fruit Extract, Enteromorpha Compressa Extract, Hamamelis Virginiana (Witch Hazel) Extract, Laminaria Digitata Extract, Macrocystis Pyrifera Extract, Spirulina Maxima Extract, Ulva Lactuca Extract, Allantoin, Ascorbyl Glucoside, Caesalpinia Spinosa Gum, Citric Acid, Erythritol, Homarine HCl, Panthenol, Potassium Hydroxide, Sodium PCA, Alcohol, Benzoic Acid, Dehydroacetic Acid, Phenoxyethanol, Potassium Sorbate, Sodium Benzoate, Benzyl Benzoate, Hexyl Cinnamal, Limonene, Linalool, Fragrance (Parfum). • Even Advanced Sea Mineral Cleansing Gel: This foamy Sea Mineral Cleansing Gel helps lather away the daily grime, refreshes and revitalizes your complexion. Made with the botanically powerful Marine Complex and Sea Minerals to promote cell regeneration and washing away dulling impurities for a smooth skin tone. Get a fresh start every time you clean. Hypo-allergenic. 6 oz. ORDER TODAY! Ingredients: Aqua (Water), Aloe Barbadensis Leaf Juice (1), Cocamidopropyl Betaine, Sodium Cocoyl Isethionate, Cocamidopropyl Hydroxysultaine, Glycerin, Sodium Lauroyl Glutamate, Camilla Sinensis Leaf Extract (1), Chlorella Pyrenoidosa Extract, Chondrus Crispus (Carrageenan) Extract (1), Enteromorpha Compressa Extract, Laminaria Digitata Extract, Macrocystis Pyrifera Extract, Spirulina Maxima Extract, Ulva Lactuca Extract (1), Ascorbyl Glucoside, Caesalpinia Spinosa Gum, Coco-Glucoside, Erythritol, Glyceryl Oleate, Homarine HCl, Panthenol, Potassium Hydroxide, Sodium Chloride, Alcohol (1), Benzoic Acid, Dehydroacetic Acid, Phenoxyethanol, Potassium Sorbate, Sodium Benzoate, Benzyl Benzoate, Hexyl Cinnamal, Limonene, Linalool, Fragrance (Parfum). • Even Advanced Sea Elements Eye Makeup Remover: This gentle, hypo-allergenic Sea Elements Eye Makeup Remover helps all 300 lashes clean, nurtured and naked in seconds. Made with botanically powerful Marine Complex and nourishing Sea Algae helps replenish the delicate eye area while waterproof mascara simply slips away without irritation or oily residue. Oil-free. Hypo-allergenic. 4 oz. ORDER TODAY! Ingredients: Aqua (Water), Dimethicone, Aloe Barbadensis Leaf Juice), Polysorbate 20, Camilla Sinensis Leaf Extract, Chlorella Pyrenoidosa Extract, Chondrus Crispus (Carrageenan) Extract, Enteromorpha Compressa Extract, Laminaria Digitata Extract, Macrocystis Pyrifera Extract, Spirulina Maxima Extract, Ulva Lactuca Extract , Ascorbyl Glucoside, Caesalpinia Spinosa Gum, Citric Acid, Erythritol, Glycerin, Homarine HCl, Panthenol, Potassium Hydroxide, Sodium Citrate, Alcohol, Benzoic Acid, Dehydroacetic Acid, Phenoxyethanol, PotassiumSorbate, Sodium Benzoate, Benzyl Benzoate, Hexyl Cinnamal. • Intense Defense Vitamin C Cleansing Gel: Pure botanical Refreshing Cleansing Gel helps lather away toxins and impurities and provides Photo-Aging Defense for renewed, glowing skin. Made with plant-derived and antioxidant-rich Vitamin C, Lemon Bioflavonoids and White Tea to calm oxidative stress and help fight the noticeable signs of photo-aging. 8.5 fl. oz. ORDER TODAY! Ingredients: Aloe Barbadensis Leaf Juice, Aqua (Water), Decyl Glucoside, Sorbitol, Coco-Glucoside, Xanthan Gum, Citrus Aurantium Bergamia (Bergamot) Fruit Oil, Citrus Aurantium Dulcis (Orange) Peel Oil, Citrus Limon (Lemon) Peel Oil, Arnica Montana Flower Extract, Camellia Sinensis Leaf Extract, Chamomilla Recutita (Matricaria) Flower Extract, Citrus Limon (Lemon) Peel Extract, Lavandula Angustifolia (Lavender) Flower/Leaf/Stem Extract, Olea Europaea (Olive) Leaf Extract, Ascorbyl Glucoside, Bisabolol, Citric Acid, Glycerin, Glyceryl Oleate, Hydrolyzed Wheat Protein, Tocopheryl Acetate, Alcohol, Benzyl Alcohol, Potassium Sorbate, Sodium Benzoate, Limonene. • Intense Defense Vitamin C Balancing Toner: Antioxidant-intensive Balancing Toner helps stabilize skin tone, replenish moisture levels, and provide Photo-Aging Defense. The pore perfecting combination of Aloe, Cucumber and Papaya Extracts help refine, moisturize, and target areas of hyperpigmentation. Formulated with plant-derived Vitamin C (antioxidant and cell energizer) to help eliminate free radical damage caused by daily sun exposure and fight the noticeable signs of photo-aging. 8.5 fl. oz. ORDER TODAY! Ingredients: Aqua (Water), Aloe Barbadensis Leaf Juice, Glycerin, Arnica Montana Flower Extract, Calendula Officinalis Flower Extract, Camellia Sinensis Leaf Extract, Carica Papaya (Papaya) Fruit Extract, Chamomilla Recutita (Matricaria) Flower Extract, Citrus Limon (Lemon) Peel Extract, Cucumis Sativus (Cucumber) Fruit Extract, Echinacea Angustifolia Extract, Ginkgo Biloba Leaf Extract, Lavandula Angustifolia (Lavender) Flower/Leaf/Stem Extract, Olea Europaea (Olive) Leaf Extract, Citrus Aurantium Bergamia (Bergamot) Fruit Oil, Citrus Aurantium Dulcis (Orange) Peel Oil, Citrus Limon (Lemon) Peel Oil, Ascorbyl Glucoside, Caprylyl/Capryl Wheat Bran/Straw Glycosides, Fusel Wheat Bran/Straw Glycosides, Glyceryl Caprylate, Polyglyceryl-5 Oleate, Salicylic Acid, Sodium Cocoyl Glutamate, Sodium Hyaluronate, Alcohol, Calcium Gluconate, Gluconolactone, Potassium Sorbate, Sodium Benzoate, Citral, Limonene, Linalool. • Intense Defense Vitamin C Cleansing Milk: Antioxidant-intensive soap-free Hydrating Cleansing Milk helps relax, even, and remove dulling impurities for supple, even skin without tightness. Made with gentle botanical cleansers, plant-derived and antioxidant-rich Vitamin C, Lemon Bioflavonoids and White Tea to calm oxidative stress and help fight the noticeable signs of photo-aging. 8.5 oz. ORDER TODAY! Ingredients: Aloe Barbadensis Leaf Juice, Aqua (Water), Stearic Acid, Glycerin, Glyceryl Stearate SE, Cetearyl Alcohol, Cetyl Alcohol, Caprylic/ Capric Triglyceride, Helianthus Annuus (Sunflower) Seed Oil, Aleurites Moluccana Seed Oil, Borago Officinalis Seed Oil, Butyrospermum Parkii (Shea Butter), Citrus Aurantium Bergamia (Bergamot) Fruit Oil, Citrus Aurantium Dulcis (Orange) Peel Oil, Citrus Limon (Lemon) Peel Oil, Hydrogenated Palm Kernel Oil, Arnica Montana Flower Extract, Camellia Sinensis Leaf Extract, Chamomilla Recutita (Matricaria) Flower Extract, Citrus Limon (Lemon) Peel Extract, Laminaria Digitata Extract(1), Lavandula Angustifolia (Lavender) Flower/Leaf/Stem Extract, Linum Usitatissimum (Linseed) Seed Extract, Olea Europaea (Olive) Leaf Extract, Ascorbic Acid, Ascorbyl Glucoside, Cetearyl Glucoside, Potassium Hydroxide, Tocopheryl Acetate, Xanthan Gum, Alcohol(1) , Benzyl Alcohol, Potassium Sorbate, Sodium Benzoate, Limonene. • CoQ10 & Rosehip Wrinkle Therapy Cleansing Milk: Wrinkle smoothing CoQ10 Repair Facial Cleansing Milk helps refine, moisturize and supports Cellular Renewal. Made with soap-free botanical cleansers, White Tea and Sunflower to gently lift away grime without drying or stripping. Formulated with CoQ10 and essential oils to nurture and promote cellular turnover. Complexion appears even, toned, healthy and supple. For normal to dry skin. 8.5 oz. ORDER NOW! Ingredients: Aloe Barbadnsis Leaf Juice, Aqua (Water), Stearic Acid, Glycerin, Glyceryl Stearate SE, Cetearyl Alcohol, Caprylic/Capric Triglyceride, Cetyl Alcohol, Helianthus Annuus (Sunflower) Seed Oil, Aleurites Moluccana Seed Oil, Borago Officinalis Seed Oil, Butyrospermum Parkii (Shea) Butter, Prunus Amygdalus Dulcis (Sweet Almond) Oil, Rosa Canina (Rosehip) Seed Oil, Arnica Montana Flower Extract, Camellia Sinensis Leaf Extract, Chamomilla Recutita (Matricaria) Flower Extract, Glycyrrhiza Glabra (Licorice) Root Extract, Lavandula Angustifolia (Lavender) Flower/Leaf/Stem Extract, Leucojum Aestivum Bulb Extract, Olea Europaea (Olive) Leaf Extract, Salix Alba (Willow) Bark Extract, Tocopheryl Acetate, Cetearyl Glucoside, Phenethyl Alcohol, Ribose, Sodium Hyaluronate, Sorbitol, Ubiquinone (CoQ10), Xanthan Gum, Alcohol, Benzyl Alcohol, Potassium Hydroxide, Potassium Sorbate, Sodium Bezoate, Citronellol, Geraniol, Linalool. • CoQ10 & Rosehip Wrinkle Therapy Perfecting Toner: Perfecting Facial Toner helps recondition and tighten through Cellular Renewal for a even and toned skin. This skin-perfecting toner helps normalize equilibrium and strengthen with powerful antioxidants to help fight the noticeable signs of aging. Made with CoQ10, Lavender, White Tea and Arnica to provide a refined, moisturized and revitalized skin. For All Skin Types. 8 oz. ORDER NOW! Ingredient Aqua (Water), Aloe Barbadensis Leaf Juice, Glycerin , Quillaja Saponaria Bark Extract, Capryly/Capryl Glucoside, Citrus Aurantium Dulcis (Orange) Peel Oil, Citrus Limonum (Lemon) Peel Oil, Lavandula Angustifolia (Lavender) Oil, Rosa Canian (Rosehip) Seed Oil (1), Arnica Montana Flower Extract, Camellia Sinensis Leaf Extract, Chamomilla Recutila (Matricaria) Flower Extract, Lavandula Angustifolia (Lavender) Flower/Leaf/Stem Extract, Leuconjum Aestivum Bulb Extract, Salix Alba (Willow) Bark Extract, Beta Pinen, Citric Acid, Glyceryl Caprylate, Linalyl Acetate, Polyglyceryl-5-Oleate, Ribose, Sodium Cocoyl Glutamate, Sodium Hyaluronate, Ubiquinone (CoQ10) Alcohol, Calcium Gluconate, Gluconolacrtone, Sodium Benzoate, Limonene, Linalool. *CoQ10 is essential for healthy youthful skin. This naturally occurring nutrient is found in every living cell of your body, and provides the source of all cellular energy for building new cells and tissue for smooth, firm skin. As a powerful antioxidant, CoQ10 neutralizes free-radicals caused by sun and environmental exposure defending your skin against further damage. Our patented CoQ10 Wrinkle Defense System guarantees 50% - 70% certified organic ingredients assuring quality and credibility. • Lavender & Prebiotics Brilliant Balance Enzyme Scrub: Multi-fruit enzymes and gentle exfoliating granules will smooth away dull surface skin and impurities. Perfect for all skin types. Improves circulation and clarity, while pampering your skin with naturally rich nutrients and powerful anti-aging antioxidants. Your face will feel youthfully refreshed, nurtured, and energized. pH balanced. 4 oz. ORDER TODAY! Ingredients: Aloe Barbadensis Leaf Juice, Water (Aqua), Caprylic/ Capric Triglyceride, Juglans Regia (Walnut) Shell Powder, Cetyl Alcohol, Glyceryl Stearate SE, Cocos Nucilera (Coconut) Oil, Helianthus Annuus (Sunflower) Seed Oil, Stearyl Alcohol, Borago Officinlis Seed Oil, Citrus Aurantifolia (Lime) Oil, Citrus Limon (Lemon) Peel Oil, Lavandula Angustifolia (Lavender) Oil, Linum Usitartissimum (Linseed) Seed Oil(1), Simmondsia Chinesis (Jojoba) Seed Oil) Arnica Montana Flower Extract, Camellia Sinensis Leaf Extract, Chamomilla Recutita (Matricaria) Flower Extract(1), Cucumis Sativus (Cucumber) Seed Extract, Cucurbita Pepo (Pumpkin) Seed Extract, Glycyrrhiza Glabra (Licorice) Rhizome/Root, Lavandula Angustifolia (Lavender) Flower/Leaf/Stem Extract, Lactobacillus Ferment Lyste, Leuconostoc/Radish Root Ferment Filtrate, Sacharomyces/Xylinum/ Black Tea Ferment, Bromelain, Citric Acid, Maltodextrin, Pumice, Stearic Acid, Xanthan Gum, Alcohol, Benzyl Alcohol, Potassium Hyrdoxide, Potassium Sorbate, Sodium Benzoate, Linomene, Linalool, Coumarin. FACE CARE: Brilliant Balance Enzyme Scrub, 4 oz. • Calm & Cool Balancing Toner: This comforting Calm & Cool Balancing Toner helps energize skin without stinging, regaining to a relaxed balance. Made with soothing Boswellia and Turmeric, moisturizing Aloe, and other natural humectants helps cool-down for red, irritated skin. For Combo or Sensitive Skin. 8 oz. ORDER TODAY! Ingredients: Purified Water, Glycerin, Panthenol, Palmitoyl tripeptide-3, Acetyl Hexapeptide-3, Boswellia Serrata Extract, Salvia Officinalis (sage) Leaf Extract, Tetrahydrobisdemethoxydiferuloly- Methane (turmeric), Coleus Forskohlii (coleus) Oil, Tetrahydropiperine (black Pepper), Bisabolol, Hamamelis Virginiana (witch Hazel) Extract, Magnesium Ascorbyl Phosphate, Hyaluronic acid, Sodium Pca, Aloe barbadensis (Aloe Vera) leaf juice, Allantoin, Punica Granatum (pomegranate) Extract, Polysorbate-20, Phenoxyethanol, Ethylhexylglycerin, Iso Jasmone, Pelargonium Graveolens (geranium) Oil, Amylcinnamic Aldehyde, Citronellol, Eugenol, Geraniol, Limonene, and other Natural Fragrances. • Clear the Surface Gentle Exfoliant:This gently effective Clear the Surface Gentle Exfoliant is made with ultrafine Walnut powder and soothing ingredients helps deliver a radiant skin, and boosts skin renewal. Gentle plant exfoliants help discard imperfections and brighten skin, nurture oils, fight off blemishes and signs of irritation. Fragrance-free. For All Skin Types. 4.2 oz. ORDER TODAY! Ingredients: Purified Water, Juglans Regia (walnut) Powder, Helianthus Annuus (sunflower) Seed Oil, Glycerin, Aloe barbadensis (Aloe Vera) leaf juice, Stearic Acid, Cetyl Alcohol, Glyceryl Stearate, Glyceryl Monolaurate, Dipotassium Glycyrrhizate, Tocopherols (Vitamin E), Panthenol, Allantoin, Sodium Pca, Azadirachta Indica (neem) Seed Oil, Coleus Forskohlii (coleus) Oil, Macrocystis Pyrifera (kelp) Extract, Arnica Cordifolia (arnica) Extract, Roman Anthernis Nobilis (chamomile) Flower Water, Lavandula Angustifolia (lavender) Flower Water, Camellia Sinensis (white Tea) Extract, Linum Usitatissmum (linseed) Seed Oil, Borago Officinalis (borage) Seed Oil•, Rosa Mosqueta (rosehip) Fruit Oil, Bromelain, Papain, Simmondsia Chinensis (jojoba) Seed Oil, Phenoxyethanol, Ethylhexylglycerin, and Benzyl alcohol. FACE CARE: Calm & Cool Balancing Toner, 8 oz. FACE CARE: Clear the Surface Gentle Exfoliant, 4.2 oz. • Sea Buckthorn Clarifying Toner: Sea Buckthorn Clarifying Toner with omega 7 fatty acids help rejuvenate, moisturize and pH balances skin. With Sea Buckthorn, Algae extracts And Aloe helps invigorate and moisturize skin, and reconditions and firms skin. Helps retain natural moisture and leaves skin feeling smooth and calm. Helps restore youthful glow and clarity. 3 oz. ORDER TODAY! Ingredients: Water, SD Alcohol 40-B, Glycerin, Pyrus Malus (Apple) Fruit Extract, Inulin, Polyglyceryl-10 Laurate, Hippophae Rhamnoides (Seabuckthorn) Fruit Extract, Hippophae Rhamnoides (Seabuckthorn) Oil, Algae Extract, Artemisia Vulgaris Extract, Allantoin, Chlorella Vulgaris Extract, Aloe Barbadensis Leaf Juice, Laminaria Digitata Extract, Leucojum Aestivum Bulb Extract, Hordeum Distichon (Barley) Extract, Phellodendron Amurense Bark Extract, Salicornia Herbacea Extract, Santalum Album (Sandalwood) Extract, Caprylic/Capric Triglycerides, Phospholipids, Xanthan Gum, Phenethyl Alcohol, Benzoic Acid, Orange and Lemon Essential Oils, Ethylhexylglycerin, Phytic Acid. • Sea Buckthorn Exfoliating Scrub: Sea Buckthorn Exfoliating Scrub with omega 7 fatty acids helps deep clean pores to reveal fresh and glowing skin. Made with Apricot, Sea Buckthorn and Aloe helps remove dead, dull skin surface cells and removes excessive oil from clogged pores. Leaves skin touchably soft and gentle enough for all skin types. 3.3 oz. ORDER TODAY! Ingredients: Water, Prunus Armeniaca (Apricot) Seed Powder, SD Alcohol 40-B, Cetearyl Alcohol, Glycerin, Polyglyceryl-3 Stearate, Hippophae Rhamnoides (Seabuckthorn) Fruit Extract, Cetearyl Phosphate, Hippophae Rhamnoides (Seabuckthorn) Oil, Prunus Armeniaca (Apricot) Kernel Oil, Hippophae Rhamnoides (Seabuckthorn) Seedcake, Aloe Barbadensis Leaf Juice, Sodium Levulinate, Cellulose Gum, Sodium Phytate, p-Anisic Acid, Orange and Lemon Essential Oils. Ingredients: Water, Decyl Glucoside, Coco-Betaine, Hydrogenated Jojoba Oil,Lauryl Glucoside, Carrageenan Ψ Benzyl Alcohol, Coco-Glucoside, GlycerylOleate, Xanthan Gum, Glycerin, Sodium Levulinate, Glycine Soja (Soybean) Oil,Glucose, Citrus Aurantium Dulcis (Orange) Peel Oil, Sodium Anisate, SodiumPhytate, Hippophae Rhamnoides (Seabuckthorn) Fruit Extract, Citrus AurantiumBergamia (Bergamot) Fruit Oil, Citrus Grandis (Grapefruit) Peel Oil, CitrusReticulata (Tangerine) Leaf Oil, Coriandrum Sativum (Coriander) Fruit Oil,Cymbopogon Citratus Leaf Oil, Panthenol. FACE CARE: Sea Buckthorn Clarifying Toner, 3 oz. FACE CARE: Sea Buckthorn Exfoliating Scrub, 3.3 oz. FACE CARE: Sea Buckthorn Polishing Facial Cleanser, 4 oz. • Non Chemical Light Skin Peel: "Peeling" gently lifts off more hardened, dried skin cells than can be achieved by scrubs or any other exfoliating" product. Dead-cell buildup prevents treatment products from penetrating and keeps skin tone from looking renewed and radiant. For aging and problem skin, PEEL is absolutely essential as it provides many multiple benefits, which one can see and feel with just one application. Light Skin Peel ingredients help invigorate the deeper new cells to move upward at a faster rate, producing the skin surface to look firmer, clearer and healthier. 1.5 oz. ORDER TODAY! Ingredients: Purified Water, SDA Alcohol 40, Crushed Almonds, Vegetable Oil, Zinc Oxide, Kaolin, Starch, Glycerin, Chamomile, Methylcellulose, Salicylic Acid, Allantoin, Papain, Potassium Sorbate, Sodium Benzoate and Citric Acid, Oil of Thyme. • Makeup Primer: Makeup Primer helps perfect skin by refining the texture, fills in lines, conceals pores, and controls excess oil. Provides skin instantly look and feel smooth and silky. Helps makeup foundation last longer (safe under eye shadow, too). Made with CoQ10 to offer protective antioxidant action. Our Makeup Primer is good for any skin type, even oily for a soft, supple skin. Completely fragrance-free and non-comedogenic (which means it won't cause clogged pores and breakouts). 1 oz. ORDER TODAY! Ingredients: Cyclopentasiloxane, dimethicone, Vitamin A Palmitate, Vitamin D3 (Cholecalciferol), Olive Oil, Coenzyme Q10, Squalane. • Rosewater Facial Spray: Natural extract of roses makes the Rosewater Facial Spray very refreshing and invigorating. Helps moisturizers and night creams have superior results in making skin look restored with makeup. For male and female athletes, this mist is a great refresher and cleansing aid. Skin will look renewed, feel softer and look better. Helps refresh skin and set makeup, spray away perspiration, hydrate skin and hair in dry weather. Use as a Sensitive-Skin Tonic. 8 oz. ORDER TODAY! Ingredients: Distilled Rosewater, Glycerin, Aloe Juice, Polysorbate 20, Hyaluronic Acid, Tocopheryl Acetate, Vegetable Oil & Vitamin A (Retinyl Palmitate) and Vitamin B (Ergocalciferol), Fennel (and) Hops (and) Balm Mint (and) Mistletoe (and) Maticaria (and) Yarrow Extracts, Mallow (and) Ivy (and) Cucumber (and) Sambucus and Arnica Extracts, Trace Mineral Concentrate, Potassium Sorbate, Sodium Benzoate, Citric Acid. FACE CARE: Light Skin Peel, 1.5 oz. FACE CARE: Makeup Primer, 1 oz. FACE CARE: Rosewater Facial Spray, 8 oz. • Smooth Shave Toner:The refreshing Smooth Shave Toner is made with Witch Hazel to fortify skin, and Myrrh to soothe small shaving wounds. Your face feels invigorated and relaxed, toned and purified. With skin this smooth and touchable, be prepared to attract even more attention than usual. With a distinctive, spicy fragrance, Smooth Shave Toner is ideal to use before and after you shave to prep and tone your face. 3.4 oz. ORDER NOW! Ingredients: Alcohol, Water (Aqua), Hamamelis Virginiana (Witch Hazel) Distillate, Fragrance (Parfum), Limonene, Linalool, Geraniol, Citral, Commiphora Myrrha (Myrrh) Extract. • One-Step Cleanser & Toner:The rinse-off lotion One-Step Cleanser & Toner is a invigorating, milky lotion for normal to combination skin that clear up and perfects without over-drying. Made with natural Olive Oil soap to work its deep-cleansing action, and Witch Hazel extract tones the skin – all in just one step. A fresh citrus fragrance, derived from pure essential oils, renews the skin and arouses the senses. Your skin is left vibrant, renewed and perfectly prepared for the next step in your facial-care regimen. You can use the One-Step Cleanser & Toner to remove make-up. 3.4 oz. ORDER NOW! Ingredients: Water (Aqua), Fragrance (Parfum), Potassium Olivate, Iris Germanica Root Extract, Hamamelis Virginiana (Witch Hazel) Distillate, Lanolin, Alcohol, Limonene, Linalool, Citral. • Refining Toner:The refreshing natural Refining Toner with organic iris root extract helps normalize moisture balance at the noticeable surface of your. Made with mildly astringent organic Wild Rose Leaf extract to clear up your skin, organic Lemon Juice helps purify your skin and refines the. Your skin looks clear and refreshed after cleansing. The delicate, fresh fragrance of natural essential oils help stimulates your senses. 3.4 oz. ORDER NOW! Ingredients: Water (Aqua), Alcohol, Rosa Moschata (Rosehip) Leaf Extract, Hamamelis Virginiana (Witch Hazel) Distillate, Citrus Medica Limonum (Lemon) Juice, Fragrance (Parfum), Limonene, Linalool, Geraniol, Citral. • Gentle Cleansing Milk:Gentle Cleansing Milk is made with organic Iris Root extract to retain moisture and normalize properties. Gently removes dirt and impurities and retains a healthy balance in your skin. Blended with organic Jojoba Seed oil helps protects natural moisture and acts as an emollient, and Witch Hazel fortifies ski. Fresh and clean, your skin is thoroughly prepared after using our Gentle Cleansing Milk for the next step of your skin care regimen. 3.4 oz. ORDER NOW! Ingredients: Water (Aqua), Sesamum Indicum (Sesame) Seed Oil, Alcohol, Simmondsia Chinensis (Jojoba) Seed Oil, Lysolecithin, Fragrance (Parfum), Glyceryl Stearate SE, Hamamelis Virginiana (Witch Hazel) Distillate, Iris Germanica Root Extract, Xanthan Gum, Limonene, Linalool, Citronellol, Geraniol, Citral. FACE CARE: Smooth Shave Toner, 3.4 oz. FACE CARE: Refining Toner, 3.4 oz. • Vitamin C CoQ10 Facial Cleanser: Vitamin C Cleanser mildly and thoroughly cleanses and revitalizes your skin without drying. This soap-free formula efficiently removes daily impurities, excessive oil, and makeup without over-cleaning. Formulated with active antioxidants Vitamin C and CoQ10 helps counterbalance sun and environmental damage to keep your skin youthful-looking. Made with botanicals to stabilize, invigorate, and tone your skin, and pure Oshadhi aroma-therapeutic essential oils help improve skin tone for a fresh, smooth, and restored skin. Gentle enough for daily use and for all skin types. pH balanced. 8.5 oz. ORDER TODAY! Ingredients: Purified Water, Lavandula Angustifolia (Lavender) Water, Disodium C14-16 Olefin Sulfonate, Cocamidopropyl Betaine, Glycereth-7 Cocoate, Glycerin, Lavandula Hybrida (Lavandin) Oil, Citrus Aurantium (Sweet Orange) Oil, Cananga Odorata (Ylang Ylang) Oil, Aloe Barbadensis (Aloe Vera) Leaf Juice, Ubiquinone (Coq-10), Calendula Officinalis (Calendula) Extract, Cucumis Sativus (Cucumber) Extract, Citrus Aurantium (Orange) Blossom Extract, Anthemis Nobilis (Chamomile) Extract, Tocopherol, Magnesium Ascorbyl Phosphate, Panthenol, Allantoin, Sodium PCA, Citric Acid, Sodium Benzoate, Potassium Sorbate. • 3% AHA Complex Facial Cleanser: AHA Facial Cleanser is a lightly-foaming, soap-free cleanser that removes dead surface skin cells, daily impurities, and excess oil without over-cleaning your skin. Made with Alpha Hydroxy Acids (AHAs) mildly and intensely clean and vigorously refine your skin without interrupting its natural balance. Pure premium Oshadi aroma-therapeutic essential oils firm, enrich, and soothe, leaving your skin fresh, vibrant, and revitalized. 8.5 oz. ORDER TODAY! Ingredients: Purified Water, Aloe Barbadensis (Aloe Vera) Leaf Juice, Sodium C14-16 Olefin Sulfonate, Cocamidopropyl Betaine, Sodium Lauryl Glucosides Hydroxypropyl Sulfonate, Lavandula Hybrida (Lavandin) Oil, Pelargonium Roseum (Geranium Rose) Oil, Citrus Sinensis (Sweet Orange) Oil, Cananga Odorata (Ylang Ylang) Oil, Lavandula Angustifolia (Lavender) Extract, Calendula Officinalis (Calendula) Extract, Anthemis Nobilis (Chamomile) Extract, Lonicera Fragrantissima (Honeysuckle) Extract, Cucumis Sativus (Cucumber) Extract, Panthenol, Allantoin, Magnesium Ascorbyl Phosphate, Glycerin, Glycolic Acid, Malic Acid, Citric Acid, Tocopherol, Sodium Benzoate, Potassium Sorbate. • Extra Gentle Cleansing Milk Facial Cleanser: Extra Gentle Facial Cleansing Milk is a luxuriant, creamy, soap-free cleanser that mildly removes daily impurities and make-up without drying your skin. Made with natural calming emollients and nutrient-rich plant oils help moisturize and protect your skin. Blended with Oshadi aroma-therapeutic essential oils and herbal extracts help normalize and tone leaving your dry/mature skin fresh, smooth, and nourished. 8.5 oz. ORDER TODAY! Ingredients: Aqua (Water), Glyceryl Stearate SE, Caprylic/Capric Triglyceride, Glycerin, Sorbitol, Carthamus Tinctorius (Safflower) Seed Oil, Sorbitan Stearate, Stearic Acid, Persea Gratissima (Avocado) Oil, Aloe Barbadensis (Aloe Vera) Leaf Juice, Tocopheryl Acetate, Simmondsia Chinensis (Jojoba) Seed Oil, Aleurites Moluccans (Kukui) Nut Oil, Rosa Canina (Rose Hip) Seed Oil, Borago Officinalis (Borage) Seed Oil, Cucumis Sativus (Cucumber) Fruit Extract, Arnica Montana (Arnica) Flower Extract, Anacylus Pyrethrum (Pellitory) Root Extract, L-Ascorbic Acid, Tocopherol, Allantoin, Cananga Odorata (Ylang Ylang) Oil, Lavandula Angustifolia (Lavender) Oil, Anthemis Nobilis (Roman Chamomile) Oil, Calendula Officinalis (Calendula) Extract, Lavandula Angustifolia (Lavender) Flower Extract, Chamomilla Recutita (Chamomile) Flower Extract, Citric Acid, Phenoxyethanol, Potassium Sorbate, Benzyl Alcohol. • Herbal Cream Facial Cleanser: Herbal Cream Facial Cleanser is a gentle, creamy, soap-free cleanser that precisely removes daily impurities and make-up without over-cleaning your skin. Made with botanicals to stabilize, rejuvenate, and tone your skin and Oshadi aroma-therapeutic essential oils help leave your skin fresh, supple, and relaxed. Non-drying. Rinses clean. 8.5 oz. ORDER TODAY! Ingredients: Water, Cetyl Alcohol, Stearyl Alcohol, Glycerin, Lauryl Glucoside, Prunus Armeniaca (Apricot) Kernel Oil, Simmondsia Chinensis (Jojoba) Seed Oil, Prunus Amygdalus Dulcis (Almond) Seed Oil, Rosa Canina (Rose Hip) Seed Oil, Persea Gratissima (Avocado) Oil, Pelargonium Roseum (Geranium) Oil, Lavandula Hybrid (Lavandin) Flower Oil, Mentha Spicata (Spearmint) Oil, Rosmarinus Officinalis (Rosemary) Oil, Aloe Barbadensis (Aloe Vera) Leaf Juice, Macrocystis Pyrifera (Kelp) Extract, Pyrus Malus (Apple) Fruit Extract, Citrus Medica Limonum (Lemon) Peel Extract, Citrus Aurantium Dulcis (Orange) Peel Extract, Allantoin, Panthenol, Sorbitol, Sodium Stearoyl Glutamate, Phenoxyethanol, Benzyl Alcohol, Potassium Sorbate, Tocopherol, Tocopheryl Acetate, Ascorbic Acid, Citric Acid. • Balancing Facial Toner: Balancing Facial Toner revitalizes, moisturizes, and conditions your skin. Made with pure aroma-therapeutic essential oils, herbal extracts, and natural humectants to gently firm, correctly balance, and nourish your skin for a healthy looking complexion. Balancing Facial Toner is invigorating, light, and never drying. Great for use after make-up removal. Ideal for all skin types. 8.5 oz. ORDER TODAY! Ingredients: Purified Water, Glycerin, Polysorbate-20, Aloe Barbadensis (Aloe Vera) Leaf Juice, Citric Acid, Sodium Citrate, Panthenol, Sodium Pca, Allantoin, Cucumis Sativus (Cucumber) Extract, Tocopherol, Magnesium Ascorbyl Phosphate, Camellia Sinensis (Green Tea) Extract, Cananga Odorata (Ylang Ylang) Oil, Pelargonium Roseum (Geranium Rose) Oil, Lavandula Hybrida (Lavandin) Oil, Cymbopogon Martinii (Palmarosa) Oil, Sorbitol, Hydrogenated Castor Oil, Phenoxyethanol, Ethyl Hexyl Glycerin. • Extra Gentle Creamy Eye Make-Up Remover: Creamy Eye & Face Make-up Remover is made with mild, premium herbal extracts and rich emollients, to remove all types of make-up, including water-resistant, entirely and simply, without irritation. Contains moisturizers to cool and calm the delicate eye area. Fragrance Free. 4 oz. ORDER TODAY! Ingredients: Purified Water, Aloe Barbadensis (Aloe Vera) Leaf Juice, Helianthus Annuus (Sunflower) Oil, Glycerin, Octyl Palmitate, Glyceryl Stearate, Capric Caprylic Triglycerides, Stearic Acid, Rosa Canina (Rose Hip) Oil, Borago Officinalis (Borage) Oil, Linum Usitatissimum (Flax Seed) Oil, Simmondsia Chinensis (Jojoba) Oil, Cucumis Sativus (Cucumber) Extract, Lavandula Angustifolia (Lavender) Extract, Calendula Officinalis (Calendula) Extract, Anthemis Nobilis (Chamomile) Extract, Camellia Sinensis (Green Tea) Extract, Camellia Sinensis (White Tea) Extract, Lavandula Angustifolia (Lavender) Hydrosol, Allantoin, Oat Beta Glucan, Panthenol, Magnesium Ascorbyl Phosphate, Cetyl Alcohol, Glycereth-7 Cocoate, PEG-40 Castor Oil, Calendula Officinalis (Calendula) Macerate, Tocopherol Acetate, Soy Lecithin, Carbomer, Phenoxyethanol, Ethyl Hexyl Glycerin, Benzyl Alcohol..
FACE CARE: Vitamin C w/ CoQ10Facial Cleanser, 8.5 oz. FACE CARE: Herbal Cream Facial Cleanser, 8.5 oz. • Deep Pore Shrink Cleansing Mask: Potent natural and organic ingredients detoxify skin and diminish the appearance of pores. This deep cleaning clay mask helps to remove oils and bacteria from the skin. Cloves, tea tree, lemongrass and other natural, organic and aromatherapeutic botanical extracts clean and smooth skin's appearance. Cleansing and minimizing pores promotes clear, youthful skin tone and a healthy complexion. 2 oz. ORDER TODAY! Ingredients: Certified Organic Floral Water of Lemongrass, Dandelion, Lemon Balm, Rosemary, Steam Distilled Water, Infusion of Certified Organic Herbs of Chamomile, Fennel& Milk Thistle, Certified Organic Aloe Vera, Kaolin Clay, Bentonite Clay, Witch Hazel, Vegetable Glycerine, Tea Tree Oil, Lemon Grass Oil, Clove Oil, Peppermint Oil, and Grapefruit Oil. • Start Up Exfoliating Face Wash: Cleanse and exfoliate skin with potent natural and organic ingredients. Clarify, cleanse and luminize skin with this revitalizing blend of natural green tea and other pure renewable plant sources. Gently exfoliate with natural fruit acids. It also appears to be capable of stimulating cellular growth for the formation of new, healthy skin - which leaves you rejuveinated and more youthful looking. Green Tea extract serves as an antioxidant, and Natural Fruit Oils are effective cleansing and aromatherapeutic agents. Invigorates and soothes. 4 oz. ORDER TODAY! Ingredients: Certified Organic Floral Water of Lavender, Rosemary, Sage, Steam Distilled Water, Infusion of Certified Organic Herbs of Red Clover, Golden Seal, Juniper Berries& Lemon Balm, Certified Organic Aloe Vera§, Decyl Glucoside, Extracts of Green Tea, Citrus, Apple and Sugar Cane, Xanthan Gum, Certified Organic Orange Oil, Lime, Lemon, Grapefruit, Tangerine, Clementine and Lemongrass Essential Oils. • Clean For A Day Creamy Face Wash: Cleanse, hydrate and remove makeup with our natural botanical cleanser. This soap-free, non-drying formula uses natural cleansing agents from sugar and corn to remove dirt and debris. Rich in natural and certified organic ingredients, the soothing scent of vanilla and tangerine will heighten your senses. Rich in moisturizers to hydrate skin as you cleanse, the soothing scent of natural vanilla and tangerine will heighten your senses. 4 oz. ORDER TODAY! Ingredients: Steam Distilled Water, Organic Floral Water of Lavender and Ginger, Herbal Infusion of Orange and Rhubarb, Organic Sunflower Oil, Decyl Glucoside, Cetearyl Glucoside, Glyceryl Stearate, Cetearth 20, Cetearyl Alcohol, Glycerin, Natural Vanilla Oil, Shea Butter, Organic Jojoba Oil, Organic Soy Oil, Caprylic Acid, Glycine, Xanthan Gum, Tangerine Oil, Organic Cocoa Butter. • Balancing Act Facial Toner: Tone and nourish skin with potent natural and organic ingredients. Revitalize tired skin with this blend of organic grapefruit, orange, ginger and lemon balm essential oils and extracts. Seaweed extract provides trace minerals while antioxidants Ester C and Vitamin E help fight the signs of aging. Use after cleansing to remove excess cleanser and prepare for moisturizing. 5.3 oz. ORDER TODAY! Ingredients: Steam Distilled Water, Organic Floral Water of Lemon Balm and Ginger, Herbal Infusion of Organic Grapefruit, Orange and White Tea, Organic Aloe Vera, Witch Hazel, Algae Extract, Glycerin, Grapefruit Oil, Organic Orange Oil, Hyaluronic Acid, Panthenol, Allantoin, Bergamot Oil, Ester C®, Tocopherol, Chlorophyllin-Copper Complex. Ingredients: Aqua, Sodium coco sulfate, Coco betaine, Glycerine, Butyrospermum Parkii (Shea Butter), Cocos Nucifera (Coconut) Water, Hippophae Rhamnoides (Sea Buckthorn) Oil, Camellia Sinensis (Green Tea) Leaf Extract, Salvia Officinalis (Sage) Leaf Extract, Cymbopogon Schoenanthus (Lemongrass) Leaf Extract, Rosmarinus Officinalis (Rosemary) Leaf Extract, Cocoglucoside, Cocos Nucifera (Coconut) Alcohol, Glycol stearate, Fragrance (Natural), Potassium Sorbate, Phenoxyethanol, Citric Acid. FACE CARE: Natural Man 3 n 1 Wash, 3.5 oz. • Orange Essence Facial Cleanser: Mild, sulfate-free face Orange Essence Facial Cleanser is made with invigorating Orange Oil and Soap Bark Extract to help remove dirt, excess oil and make-up. Combined with Olive and Oat Oils, Aloe and Glycerin to help nurture your skin. Orange Essence Facial Cleanser washes easily for a naturally refreshing feeling. 4 oz. tube. ORDER TODAY! Ingredients: Glycerin, Olea Europaea (Olive) Fruit Oil, Limonene, Avena Sativa (Oat) Kernel Flour, Citrus Aurantium Dulcis (Orange) Oil, Avena Sativa (Oat) Kernel Oil, Lanolin, Aloe Barbadensis Leaf Juice, Quillaja Saponaria (Quillaja) Bark Extract, Helianthus Annuus (Sunflower) Seed Oil, Beta-Carotene, Tocopherol, Rosmarinus Officinalis (Rosemary) Leaf Extract, Glycine Soja (Soybean) Oil, Canola Oil (Huile De Colza), Potassium Sorbate, Sodium Benzoate. • Garden Tomato Toner: Blended with Tomato, Cucumber and Parsley Extracts help remove dirt, oil and make-up and tighten pores. Made with a Fruit Acid Complex containing Sugar Cane, Sugar Maple, and Bilberry Extracts rich in Alpha Hydroxy Acids helps encourage to exfoliate dead skin cells for a renewed, glowing skin. Also helps to prime your skin to get the most out of your moisturizer. 8 oz. ORDER TODAY! Ingredients: Water, Alcohol Denat., Glycerin, Cucumis Sativus (Cucumber) Fruit Extract, Camellia Sinensis (Green Tea) Leaf Extract, Carum Petroselinum (Parsley) Extract, Solanum Lycopersicum (Tomato) Fruit Extract, Vaccinium Myrtillus (Bilberry) Extractsaccharum Officinarum (Sugar Cane) Extract, Acer Saccharum (Sugar Maple) Extract, Citrus Aurantium Dulcis (Orange) Peel Oil, Citrus Medica Limonum (Lemon) Peel Oil, Fragrance. • Soap Bark & Chamomile Deep Cleansing Cream: A cleanser that's all bark and no bite. This rich facial cleansing cream is gentle, yet effective. Naturally cleansing soap bark and healing aloe vera moisturize and soften skin while effectively removing makeup and dirt. Meanwhile, chamomile and echinacea soothe and calm for naturally fresh, healthy skin. Soap Bark is used as a natural soap, cleanser and foaming agent and contains antioxidants and proteins. 6 oz. ORDER TODAY! Ingredients: Water, helianthus annuus (sunflower) seed oil, stearic acid, glycerin, cocos nucifera (coconut) oil, cetearyl alcohol, polysorbate 60, sodium borate, cetyl alcohol, silica, glucose, hamamelis virginiana (witch hazel) leaf extract, aloe barbadensis leaf extract, anthemis nobilis (chamomile) flower extract, echinacea angustifolia (coneflower) extract, quillaja saponaria (soap) bark extract, theobroma cacao (cocoa) seed butter, rosmarinus officinalis (rosemary) leaf extract, tocopherol, citrus medica limonum (lemon) peel oil, coriandrum sativum (cilantro) oil, artemisia dracunculus (tarragon) oil, lavandula hybrida (lavandin) oil, jasminum grandiflorum (jasmine) flower oil, xanthan gum, sucrose stearate, menthol, glucose oxidase, lactoperoxidase. • Peach & Willowbark Deep Pore Scrub: Scrub your skin peachy clean. Finely ground peach stone naturally and gently exfoliates your skin, while willowbark and golden seal help clear pores. This natural facial cleanser also contains ginger and sea algae extracts to revitalize your skin and replenish essential minerals, leaving your face deeply clean and naturally nourished. Willowbark Extract — This extract contains natural Beta Hydroxy Acids, which work as a natural skin exfoliants to help unplug follicles and pores. 4 oz. ORDER TODAY! Ingredients: water, vitis vinifera (grape) seed oil, stearic acid, glycerin, prunus persica (peach) seed powder, cocos nucifera (coconut) oil, sodium borate, fragrance, salix nigra (willow) bark extract, glucose, anthemis nobilis (chamomile) flower extract, hydrastis canadensis (golden seal) extract, zingiber officinale (ginger) root extract, fucus vesiculosus (bladderwrack) extract, xanthan gum, sucrose stearate, glucose oxidase, lactoperoxidase. FACE CARE: Orange Essence Facial Cleanser, 4 oz. Soap Bark & Chamomile Deep Cleansing Cream, 6 oz. Peach & Willowbark Deep Pore Scrub, 4 oz. FACE CARE: Garden Tomato Facial Toner, 8 oz. • Natural Acne Solutions Pore Refining Scrub: Clinically proven to exfoliate dead skin cells while refining appearance of pores without over-drying or irritating skin. Helps reduce acne and prevent future break outs with Salicylic Acid from Willow Bark. Blended with Jojoba Beads and a Fruit Acid Complex to gently exfoliate, delivering a refined, clear and smooth skin. Designed for acne-prone skin. Noncomedogenic. Dermatologist Tested. 5 oz. ORDER TODAY! Active Ingredient: Salicylic Acid (1.0%). Inactive Ingredients: Water, Vitis Vinifera (Grape) Seed Oil, Stearic Acid, Glycerin, Hydrogenated Jojoba Oil, Salix Nigra (Willow) Bark Extract, Cocos Nucifera (Coconut Oil), Sodium Borate, Fragrancevaccinium Myrtillus (Bilberry) Extract, Saccharum Officinarum (Sugar Cane) Extract, Citrus Aurantium Dulcis (Orange) Fruit Extract, Citrus Medica Limonum (Lemon) Fruit Extract, Acer Saccharum (Sugar Maple) Extract, Sucrose Stearate, Xanthan Gum, Glucose Sodium Chloride, Glucose Oxidase, Lactoperoxidase. • Natural Acne Solutions Purifying Gel Cleanser: Clinically proven to wash away acne causing bacteria, excess oil and impurities without over-drying or irritating skin. Made with Salicylic Acid from Willow Bark help reduce acne and prevent future breakouts. Evening Primrose and Beet Root Extracts help calm acne prone skin. The result is naturally clear and healthy-looking skin. Noncomedogenic. Dermatologist Tested. 5 oz. ORDER TODAY! Active Ingredient: Salicylic Acid (1.0%). Inactive Ingredients: Water, Decyl Glucoside, Lauryl Glucoside, Sucrose Laurate, Salix Nigra (Willow) Bark Extract, Coco-Betaine, Betaine, Beta Vulgaris (Beet) Root Extractoenothera Biennis (Evening Primrose) Leaf Extract, Sodium Cocoyl Hydrolyzed Soy Protein, Hydroxypropyltrimonium Honey, Glycerin, Glyceryl Oleate, Coco-Glucoside, Fragrance, Glucose, Alcohol Denat., Glucose Oxidase, Lactoperoxidase, Citric Acid Sodium Chloride, Phenoxyethanol. • Natural Acne Solutions Targeted Spot Treatment: Targeted Spot Treatment is clinically proven to help reduce and improve the appearance of blemishes in 48 hours without irritating skin. Made with Tea Tree, Calendula, Yarrow, and Parsley Extracts to helps soothe and reduce redness while Borage Extract promotes healthy skin. Resulting in clear, smooth skin. Designed for acne-prone skin. Noncomedogenic. Dermatologist Tested. 0.26 oz. ORDER TODAY! 2014 Elle International Beauty Awards Winner! Active Ingredient: Salicylic Acid (0.75%). Inactive Ingredients: Alcohol Denat., Citrus Medica Limonum (Lemon) Peel Oil, Water, Calendula Officinalis Flower Extract, Achillea Millefolium (Yarrow) Extract, Borago Officinalis (Borage) Extractcarum Petroselinum (Parsley) Extract, Foeniculum Vulgare (Fennel) Fruit Oil, Salix Nigra (Willow) Bark Extract, Melaleuca Alternifolia (Tea Tree) Leaf Oil, Eucalyptus Globulus Leaf Oil, Juniperus Communis Fruit Oil. • Papaya Glycolic Gentle Skin Peel: A unique herbal Papaya Glycolic Gentle Skin Peel is scientifically formulated with Papaya Fruit extract and Apricot Kernel oil to refine and refresh skin. Made with gentle Papaya enzymes and Glycolic Acid to reveal smooth and revived skin. 4 oz. ORDER TODAY! Ingredients: Aqua (Water), Prunus Amygdalus Dulcis (Sweet Almond) Seed Meal, Potato Starch Modified, Bentonite, Prunus Armeniaca (Apricot) Kernel Oil, Hydroxypropyl Methylcellulose, Glycerin, Carica Papaya (Papaya) Fruit Extract, Hypnea Musciformis Extract, Gellidiela Acerosa Extract, Sargassum Filipendula Extract, Citrus Grandis (Grapefruit) Seed Extract, Chamomilla Recutita (Matricaria) Flower Extract, Salvia Officinalus (Sage) Leaf Extract, Hamamelis Virginiana (Witch Hazel) Extract, Lavendula Angustifolia (Lavender) Oil, Thymus Vulgaris (Thyme) Leaf Oil, Allantoin, Sorbitol, Glycolic Acid, Lactic Acid, Sodium Hydroxide, Citric Acid, Ethylhexylglycerin, Potassium Sorbate, Phenoxyethanol, Titanium Dioxide (CI 77891), Fragrance (Parfum). • Kukui & Macadamia Whipped Cream Cleanser: Maintain your skin looking young and glowing with this rich and luxurious Kukui & Macadamia Whipped Cream Cleanser. Gently cleans without drying. Made with Hyaluronic Acid and emollient Nut oils to help replenish moisture, soften, and smooth skin while you wash. 5.8 oz. ORDER TODAY! Ingredients: Aqua (Water), Sodium Cocoyl Isethionate, Stearic Acid, Cetearyl Alcohol, Prunus Amygdalus Dulcis (Sweet Almond) Oil, Glycol Stearate, Panax Ginseng Extract, Micellized Beta-Carotene, Prunus Armeniaca (Apricot) Kernel Oil, Macadamia Ternifolia Nut Oil, Sodium Hyaluronate, Aleurites Moluccana (Kukui) Nut Oil, Citric Acid, Laureth-4, Phenoxyethanol, Hydroxypropyl Guar, Sorbic Acid, Sodium Hydroxymethylglycinate, Potassium Sorbate, Fragrance (Parfum). • A-D-E Creamy Fruit Oil Cleanser: A-D-E Creamy Fruit Oil Cleanser is made with rich natural fruit oils in a creamy base to cleanse the skin and remove makeup and impurities without using drying soaps. Helps hydrate and cleanse to keep skin soft with no greasy feeling. Ideal for removing oil-based cosmetics. Use daily as a routine cleanser for dry, normal and sensitive skin types. Follow with Aloe Vera Complexion Toner & Freshener. 8 oz. ORDER TODAY! Ingredients: Aqua (Water), Helianthus Annuus (Sunflower) Seed Oil, Glyceryl Stearate, Peg-8 Stearate, Ricinus Communis (Castor) Seed Oil, Prunus Amygdalus Dulcis (Sweet Almond) Oil, Prunus Armeniaca (Apricot) Kernel Oil, Glycine Soja (Soybean) Oil, Allantoin, Glycerin, Peg-10 Soya Sterol, Persea Gratissima (Avocado) Oil, Tocopherol, Aloe Barbadensis Leaf Juice Powder, Glyceryl Dilaurate, Ascorbic Acid, Xanthan Gum, Sodium Hydroxymethylglycinate, Polysorbate 20, Citrus Grandis (Grapefruit) Seed Extract, Potassium Sorbate, Lactic Acid, Phenoxyethanol, Fragrance (Parfum). • Aloe Vera Complexion Toner & Freshener: An exclusive alcohol-free, non-drying Aloe Vera Complexion Toner & Freshener helps refine and remove dirt, makeup, and impurities from pores. This invigorating, toning and cooling freshener helps firm and rejuvenate the skin. Made with the richness of Aloe Vera, Panthenol, Hyaluronic Acid and Sea Kelp to hydrate the normal, dry and sensitive skin. 8 oz. ORDER TODAY! Ingredients: Aqua, Aloe Barbadensis Leaf Juice, Algae Extract, Panthenol, Hamamelis Virginiana (Witch Hazel) Extract, Glycyrrhiza Glabra (Licorice) Root Extract, Macrocystis Pyrifera (Kelp) Extract, Bixa Orellana (Annatto) Extract, Calendula Officinalis Flower Extract, Chamomilla Recutita (Matricaria) Flower Oil, Citrus Grandis (Grapefruit) Seed Extract, Lavandula Angustifolia (Lavender) Oil, Retinyl Palmitate, Oleth-20, Cellulose Gum, Pentetic Acid, Zinc Sulfate, Acetamide MEA, Glycerin, Sodium Hyaluronate, Ascorbic Acid, Lactic Acid, Potassium Sorbate, Phenoxyethanol, Fragrance (Parfum). • 145 Quick Fix Calming Mist: This soothing 145 Quick Fix Calming Mist helps fight blemishes, relieves irritated skin, ingrown hair and razor burn. Made with Witch Hazel, Salicylic Acid, Willow Bark and Gotu Kola extracts to calm, clear pores, exfoliate and comfort skin; and Hyaluronic Acid, Aloe, and Echinacea helps moisturize. Helps provide toning and natural astringents for oily skin. Fresh new cedar mint fragrance. (Tip: Women should consider Quick Fix for sensitive bikini area.) 5.9 oz. ORDER TODAY! Ingredients: Water, Alcohol Denat., Hamamelis Virginiana (Witch Hazel) Water, Mentha Piperita (Peppermint) Extract, Hydrolyzed Cicer Seed Extract, Annona Squamosa Seed Extract, Salicylic Acid, Sodium Hyaluronate, Glycerin, Aloe Barbadensis Leaf Juice, Echinacea Angustifolia Extract, Salix Alba (Willow) Bark Extract, Centella Asiactica (Gotu Kola) Extract, Polysorbate 20, All-Natural Fragrance. • Apricot Gentle Facial Scrub: Our best-seller! Apricot Gentle Facial Scrub gently cleanses and exfoliates for a soft, supple and refreshed skin. 4.5 oz. ORDER TODAY! Ingredients:Aqua, Juglans Regia (Walnut) Shell Powder, Sodium Coco Sulfate, Decyl Glucoside, Cetyl Alcohol, Stearic Acid, Cocoglycerides, Glycerin, Glyceryl Stearate SE, Avena Sativa (Oat) Kernel Flour, Titanium Dioxide, Sodium Cocoyl Apple Amino Acids, Xanthan Gum, Allantoin, Prunus Armeniaca (Aprioct) Kernel Oil, Citrus Aurantium Dulcis (Orange) Fruit Extract, Citrus Medica Limonum (Lemon) Fruit Extract, Vaccinium Myrtillus (Bilberry) Extract, Saccharum Officinarum (Sugar Cane) Extract, Cymbopogon Schoenanthus (Lemongrass) Extract, Urtica Dioica (Nettle) Extract, Chamomilla Recutita (Matricaria) Flower Extract, Citrus Grandis (Grapefruit) Fruit Extract, Sorbitol, Sodium PCA, Glutamic Acid, Serine, Betaine, Glycine, Alanine, Arginine, Lysine, Threonine, Proline, Citric Acid, Potassium Sorbate, Phenoxyethanol, Fragrance (Parfum). FACE CARE: Papaya Glycolic Gentle Skin Peel, 4 oz. FACE CARE: Kukui & Macadamia Whipped Cream Cleanser, 5.8 oz. FACE CARE: 145 Quick Fix Calming Mist, 5.9 oz. FACE CARE: Aloe Vera Complexion Toner & Freshener, 8 oz. A-D-E Creamy Fruit Oil Cleanser, 8 oz. FACE CARE: Apricot Gentle Facial Scrub, 4.5 oz. Ingredients: Aqueous Infusion of Aloe Barbadensis Leaf Juice, Disodium Cocoamphodiacetate, Sodium Lauryl Sulfoacetate, Disodium Laureth Sulfosuccinate, Cocamidopropyl Betaine, Glycerin, Panthenol, Peg-150 Distearate, Cucumis Sativus (Cucumber) Fruit Extract, Rosemarinus Officinalus (Rosemary)Leaf Extract, Ascorbic Acid, Betula Alba (Birch) Bark Extract, Sodium Hyaluronate, Lavandula Angustifolia (Lavender) Extract, Macrocystis Pyrifera (Kelp) Extract, Citrus Grandis (Grapefruit) Seed Extract, Zinc Sulfate, Citric Acid, Potassium Sorbate, Phenoxyethanol, Fragrance (Parfum). • Clarifying Herbal Astringent: Clarifying Herbal Astringent helps remove soap residue, trapped oil and dead skin while revitalizing and toning. Made with extracts of Witch Hazel, Sage, Rosemary, Horsetail, Cucumber, Sea Kelp and Peppermint provide gentle astringency, tone and refresh oily skin. Blended with Sulfur, Camphor and Zinc to help reduce oil. Natural Hyaluronic Acid delivers oil-free moisture. 9 oz. ORDER TODAY! Ingredients: Aqua (Water), Hamamelis Virginiana (Witch Hazel) Extract, Glycerin, Chamomilla Recutita (Matricaria) Flower Extract, Cucumis Sativus (Cucumber) Fruit Extract, Equisetum Arvense (Horsetail) Leaf Extract, Macrocystis Pyrifera (Kelp) Extract, Citrus Grandis (Grapefruit) Seed Extract, Rosmarinus Officinalis (Rosemary) Leaf Extract, Salvia Officinalis (Sage) Leaf Extract, Bixa Orellana (Annatto) Extract, Ascorbic Acid, Allantoin, Panthenol, Apple Cider Vinegar, Polysorbate 20, Mentha Piperita (Peppermint) Extract, Sodium PCA, Camphor, Cellulose Gum, Sulfur, Sodium Hyaluronate, Sorbic Acid, Zinc Sulfate, Phenoxyethanol, Fragrance (Parfum). • Herbal Tonic Mist: Refresh, cool and revitalize your skin with this completely natural, ultra-pure Herbal Tonic Mist. Made with the extracts of Raspberry Leaf, Aloe Vera, Calendula, Sea Kelp, Chamomile, Comfrey and Fennel to energize and moisturize the skin anytime. Blended with ultra-moisturizers such as Panthenol, Sodium PCA, and Hyaluronic Acid to hydrate and improve the skin's appearance while firming and protecting it from the drying effects of the sun. Great for use on face and body. 9 oz. ORDER TODAY! Ingredients: Aqua (Water), Aloe Barbadensis Leaf Juice, Hamamelis Virginiana (Witch Hazel) Extract, Panthenol, Glycerin, Arnica Montana Flower Extract, Sodium Hyaluronate, Calendula Officinalis Flower Extract, Rubus Idaeus (Raspberry) Fruit Extract, Chamomilla Recutita (Matricaria) Flower Extract, Hypnea Musciformis (Algae) Extract, Gellidiela Acerosa (Algae) Extract, Sargassum Filipendula (Algae) Extract, Symphytum Officinale (Comfrey) Leaf Extract, Foeniculum Vulgare (Fennel) Fruit Extract, Citrus Grandis (Grapefruit) Seed Extract, Allantoin, Biotin, Niacin, Sorbic Acid, Sodium PCA, Sorbitol, Polysorbate 20, Phenoxyethanol, Fragrance (Parfum). • Chamomile & Green Tea Eye Makeup Remover: A gentle and effective herbal Eye Makeup Remover helps purify and revitalize the skin while removing makeup. Great for removing mascara. Non-irritating; no artificial colors; 100% fragrance free. 4 oz. ORDER TODAY! Ingredients: Aqua (Water), Disodium Cocoamphodiacetate, Decyl Glucoside, Glycerin, Sodium Hyaluronate, Hydroxyethylcellulose, Tocopherol, Allantoin, Vaccinium Myrtillus (Bilberry) Extract, Beta Glucan, Chamomilla Recutita (Matricaria) Flower Extract, Euphrasia Officinalis (Eyebright) Extract, Foeniculum Vulgare (Fennel) Fruit Extract, Camellia Sinensis (Green Tea) Extract, Camellia Oleifera (Green Tea) Leaf Extract, Saccharomyces Cerevisiae Extract, Ascorbic Acid, Lactic Acid, Sodium Hydroxymethylglycinate, Phenoxyethanol. FACE CARE: Chamomile & GreenTea Eye Makeup Remover, 4 oz. • Skin Refining Scrub Lavender & Loofah: Skin Refining Scrub Lavender & Loofah helps to exfoliate and revitalize the complexion. Recommended for dry and mild combination facial types. Supplemented with natural extracts to recover skin firmness, purity and brightness.. 4.5 oz. ORDER TODAY! Ingredients: Deionized Water, Vegetable Glycerin, Glyceryl Stearate, Jojoba Wax Beads, Almond Glyceride, Stearyl Alcohol, Almond Meal, Oat Meal, Chamomile Extract, Rosemary Extract, Rosebud Extract, Calendula Extract, Horsetail Extract, Lavender Extract, Sea Kelp Ash, Algae Extract, Cucumber Extract, Essential Oils of Peppermint, and Ylang Ylang, Allantoin, Methyl and Propyl Paraben. • Skin Refining Scrub Grapefruit & Bamboo: Skin Refining Scrub Grapefruit & Bamboo is an invigorating scrub for combination "T-Zone" skin types. 4.5 oz. ORDER TODAY! Ingredients: Distilled Water, Organic Oats (Avena Sativa), White Clay (Kaolin), Vegetable Emulsifying Wax (Coconut), Aloe Vera, Vegetable Glycerin, Bamboo Fibers (Bambusa Vulgaris), Almond Meal And Almond Glycerides (Prunus Dulsis), Sunflower Oil (Helianthus Annuus), Organic herbs of: Sea Kelp (Laminaria), Chamomile (Matricaria Recutita), Rosemary (R. Officinalis), Rose Petals (Rosa Spp. ), Calendula (C. Officinalis), Horsetail Herb (Equisetum Arvense), Lavender (L. Officinlis), Garcinia Seed Butter (G. Indica), Walnut Powder (Juglansregia); Essential Oils Of Grapefruit (Citrus Paradisi), Black Current (Ribes Nigrum), Quaking Aspen (Populous Tremuloides), Sodium Benzoate, Allantoin (Comfrey), Potassium Sorbate, Xanthan Gum. • Skin Refining Scrub Peppermint & Oats:Skin Refining Scrub Peppermint & Oats is an revitalizing scrub for younger skin types or blemished skin conditions. 4.5 oz. ORDER TODAY! Ingredients: Distilled Water, Vegetable Glycerin, Glyceryl Stearate, Jojoba Wax Beads, Almond Glyceride, Sea Kelp, Almond Meal, Oat Meal, Extracts of Chamomile, Rosemary, Rose Bud, Calendula, Horsetail, Lavender, Grapefruit Seed, Essential Oils of Peppermint and Ylang Ylang, Allantoin, Ascorbic Acid. • Hydrating Cleanser: A mild soap-free Rose and Lavender cleansing milk blended with Avocado, Macadamia, and Jojoba Oils to clean dry and parched complexions without skin dry-out. Hydrating Cleanser helps hydrate and clean. It is ideal to remove make-up from delicate eye areas also. Especially for delicate and mature skin types. 4 oz. ORDER TODAY! Ingredients: Deionized Water, Extracts of Orange Blossoms, Rose Bud, Bulgarian Chamomile, Horsetail and French Lavender, Vegetable Glycerin, Kukui Nut, Macadamia Nut, Glyceryl Sterate, Aloe Vera Gel, Stearic Acid, Jojoba Nut Oil, Sorbitol, Avocado Seed oil, Cucumber Extract, Allantoin, Panthenol (Pro-Vitamin B5), Borage Seed Oil, Vitamin E (Alpha Tocopherl), Vitamin A (Beta Carotene) and Vitamin C (Ascorbyl Palmitate), Essential Oils of Geranium and Ylang Ylang, Methyl and Propyl Paraben. FACE CARE: Skin Refining Scrub, 4.5 oz..
FACE CARE: Hydrating Cleanser, 4 oz. • Gentle Facial Wash Super-C Cleanser: Super-C™ Cleanser gently and efficiently lifts makeup, dirt and excess oil, showing radiant-looking skin without over-drying. This exclusive, multi-antioxidant complex of Ester-C®, Vitamin C and Vitamin E helps fight free radicals that give fine lines, wrinkles and uneven skin tone. Instantly, your skin feels fresh with a natural, revitalizing radiance. Ideal for all skin types. 6 oz. ORDER TODAY! Ingredients: Aqua (Water), Cocamidopropyl Betaine, Sodium Cocoyl Isethionate , Cocamidopropyl Hydroxysultaine, Glycerin, Sodium Lauroyl Glutamate, Aloe Barbadensis Leaf Juice, Citrus Aurantium Dulcis (Orange) Flower Water, Ascorbic Acid, Calcium Ascorbate, Coco-Glucoside, Glyceryl Oleate, Panthenol, Sodium PCA, Tocopheryl Acetate, Benzoic Acid, Dehydroacetic Acid, Phenoxyethanol, Benzyl Alcohol, Benzyl Benzoate, Limonene, Fragrance (Parfum)..
• ph Balancing Antioxidant Toner Super-C Toner: Super-C™ Toner helps refine, rejuvenate and tones your skin. The exclusive combination of multi-antioxidants Ester-C® and Vitamin C helps combat free radicals that cause fine lines, wrinkles and uneven skin tone. Perfectly pH balanced and prepped, your skin is equipped for the hydrating and protective properties of our other C-Effects products. Ideal for all skin types. 6 oz. ORDER TODAY! Ingredients: Aqua (Water), Polysorbate 20, Glycerin, Aloe Barbadensis Leaf Juice, Chamomilla Recutita (Matricaria) Flower Extract, Hamamelis Virginiana (Witch Hazel) Extract, Myrtus Communis Leaf Extract, Ascorbic Acid, Calcium Ascorbate, Panthenol, Potassium Hydroxide, Sodium PCA, Xanthan Gum , Alcohol, Benzoic Acid , Dehydroacetic Acid, Phenoxyethanol, Sodium Benzoate, Benzyl Salicylate, Limonene, Fragrance (Parfum)..
• Brightening Apricot Scrubble: This mild, soap-free foaming Brightening Apricot Scrubble polishes away impurities, oil and makeup for a fresh, relaxed feel. Made with brightening Apricot Oil and triple refined Walnut Powder to gently wash away dead skin cells for a smooth and radiant complexion. Mild enough to use every day, it's a gentle way to awaken your skin, with no pore-clogging residue. 4 oz. ORDER TODAY! Ingredients: Aqua (Water), Cocamidopropyl Betaine, Glyceryl Stearate SE, Cetyl Alcohol, Juglans Regia (Walnut) Shell Powder, Glycerin, Stearic Acid, Aloe Barbadensis Leaf Juice, Calendula Officinalis Flower Extract, Chamomilla Recutita (Matricaria) Flower Extract, Prunus Armeniaca (Apricot) Kernel Oil, Simmondsia Chinensis (Jojoba) Seed Oil, Allantoin, Steareth-20, Xanthan Gum, Alcohol, Phenoxyethanol, Potassium Sorbate, Sodium Benzoate, Fragrance (Parfum). FACE CARE: Super-C Cleanser, 6 oz. FACE CARE: Super-C™ Toner, 6 oz. Brightening Apricot Scrubble, 4 oz. • The Wash Gentle Purifying Cleanse: Restorative The Wash Gentle Purifying Cleanse is made with Organic Essential Oils and Ocean Minerals to provide a therapeutic facial cleanser for all skin types. The Ocean Minerals nurture and restore skin lesions, dry skin, blemished skin, and rough, damaged skin. The Wash Gentle Purifying Cleanse is blended with Vitamin E and Rose Hip Oil to reduce discoloration and repair scarring. Botanicals calm and replenish skin cells and invigorate cellular regeneration. 4 oz. ORDER TODAY! Ingredients: Organic Herbal Infusion, Organic Aloe Barbadensis Leaf Juice (Aloe Vera), Methylsulfonylmethane (MSM), Lavandula Officinalis (Lavender Water), Decyl Glucoside, Cocamidopropyl Hydroxysultaine, Cocamidopropyl Betaine (From Coconuts), Cocamide MIPA, Disodium Laureth Sulfosuccinate, Disodium Lauryl Sulfosuccinate, Ocean Mineral Complex, Hydroxyethyl Cellulose, Carrageenan Gum, Salvia Sclarea (Clary Sage Essential Oil), Olea Europaea (Olive Oil), Organic Rosa Canina (Rose Hip Oil), Borago Officinalis (Borage Oil), Citrus Aurantium Dulcis (Orange Peel Tincture), Origanum Compactum (Oregano Oil), Melaleuca Alternifolia (Tea Tree Oil), Citrus Grandis (Grapefruit Seed), Organic Calendula Officinalis (Calendula), Origanum Arctium Lappa (Burdock Root), Organic Trifolium Pratense (Red Clover), Organic Rosmarinus Officinalis (Rosemary), Tocopheryl Acetate (Vitamin E), Sodium Benzoate, Potassium Sorbate, Ethyl Hexyl Glycerin. • The Toner Refreshingly Clean Mist: The Toner Refreshingly Clean Mist is made with Vitamin C to rejuvenate the skin and fighting free, and MSM directs the active ingredients deep into the skin. The Toner Refreshingly Clean Mist is blended with the Colloidal Silver and Geranium Oil provides skin restoring properties, Bee Propolis preserves the integrity of the skin. Skin is nurtured, stabilized and toned. 4 oz. ORDER TODAY! Ingredients: Mineral Water With Magnesium, Potassium, And Silica, Organic Aloe Barbadensis Leaf Juice (Aloe Vera), Hamamelis Virginiana (Witch Hazel), Methylsulfonylmethane (MSM), Colloidal Silver, Lavandula Officinalis (Lavender Distillate), Pelargonium Graveolens (Geranium Essential Oil), Caprylyl Capryl Glucoside, Hydroxyethyl Cellulose, Carrageenan Gum, R Lipoic Acid, Citrus Grandis (Grapefruit Seed), Rosmarinus Officinalis (Rosemary Seed Extract), Sodium Ascorbyl Phosphate (Vitamin C), Glycolic Acid, 19+ Enzymatic Concentrate (All From Plant Sources), Camu Camu Berry, Calophyllum Inophyllum (Oil Of Tamanu), Morinda Citrifolia (Noni), Citrus Limon (Lemon Essential Oil), Wildcrafted Camellia Sinensis (Green Tea), Chamaemelum Nobile (Chamomile Essential Oil), Wildcrafted Arnica Montana (Arnica), Melaleuca Alternifolia (Tea Tree Essential Oil), Wildcrafted Resina Propoli (Propolis), Daucus Carota Sativa (Carrot Oil), Tocopheryl Acetate (Vitamin E), Sodium Benzoate, Potassium Sorbate, Ethyl Hexyl Glycerin. FACE CARE: The Wash Gentle Purifying Cleanse, 8 oz. FACE CARE: The Toner Refreshingly Clean Mist, 4 oz. • Purifying Facial Cleanser STEP 1: With volcanic ash to dislodge and absorb pollutants, activated charcoal to extract impurities and detoxify, and super-antioxidants acai and goji berry to rejuvenate your face and recharge cells. Leaves skin refreshed and hydrated. pH balanced. For all skin types. 7 oz. ORDER TODAY! Ingredients: Purified Water, Aloe Barbadensis (Aloe Vera), Leaf Juice, Cocamidopropyl Betaine, Decyl Glucoside, Sodium Laurayl Sarcosinate, Tocopheryl Acetate (Vitamin E), Retinyl Palmitate), (Vitamin A Palmitate), Euterpe Oleracea (Acai Berry) Extract Lycium Barbarum (Goji Berry) Extract, Ficus Carica (Fig) Extract, Camellia Sinensis (Green Tea) Extract, Vaccinium Myrtillus Fruit Extract, Saccharum Officinarum (Sugar Cane) Extract, Acer Saccharum (Sugar Maple) Extract, Citrus Aurantium Dulcis (Orange) Fruit Extract, Citrus Medica Limonum (Lemon) Fruit Extract, Xanthan Gum, Menthyl Lactate, Iron Oxides, Sodium PCA, Lecithin, Polysorbate 20, Carbon (Activated Charcoal), Volcanic Ash, Potassium Sorbate, Phenoxyethanol, Natural Fragrance. • Purifying Facial Scrub STEP 2: For your skin to be pure and detoxified, you need this gentle exfoliating scrub. With volcanic ash to dislodge pollutants and activated charcoal to extract impurities and help detoxify skin, without drying. Super-antioxidants acai and goji berry help recharge cells: Leaves your face buffed and smooth. pH balanced. For all skin types. 4 oz. ORDER TODAY! Ingredients: Purified Water, Aloe Barbadensis (Aloe Vera) Leaf Juice, Isopropyl Palmitate, Capylic/Capric Triglyceride, Glycerin, Sodium Lauroyl Sarcosinate, Jojoba Seed Powder, Pumice, Tocopheryl Acetate (Vitamin E), Lecitin, Retinyl Palmitate (Vitamin A Palmitate), Euterpe Oleracea (Acai Berry) Extract, Lycium Barbarum (Gogi Berry) Extract, Ficus Carica (Fig) Extract, Carmellia Sinesis (Green Tea) Extract, Rosmarinus Officinalis (Rosemary) Leaf Extract, Vaccinium Mytillus Furit Extract, Officianalis Acer Saccharum (Sugar Maple) Extract, Citrus Aurantium Dulcis (Orange) Fruit Extract, Citrus Medica Limonum (Lemon) Fruit Extract, Iron Oxides, Menthyl Lactate, Sodium PCA, Behenyl Alcohol, Cetyl Alcohol, Butyrospermum Parkii (Shea Butter), Carbon (Activated Charcoal), Volcanic Ash, Potassium Sorbate, Phenoxyethanol, Natural Fragrance. • Replenishing Facial Moisturizer STEP 3: Replenishing Facial Moisturizer is made with skin cleansing Volcanic Ash, activated Charcoal, and super-antioxidants Acai and Goji Berry helps revive and revitalize facial cells. Helps fight damaging effects of free radicals. Blended with vitamins, minerals, nutrients, herbs and oils to provide your skin with the moisture and hydration that your face needs to maintain a healthy, youthful appearance. Contains Green Tea, Fig and high performance moisturizers to make skin feel soft and renewed. 4 oz. ORDER TODAY! • Alcohol-Free Witch Hazel Toner Cucumber: Stay Cool as a Cucumber in any weather. Alcohol-Free Cucumber Witch Hazel with Aloe Vera Formula Toner cooling essence has a refreshingly calm effect on the body. Experience the formula for calmness now! Fragrance-Free and Hypoallergenic. 12 oz. ORDER TODAY! Ingredients: Purified Water, Aloe Barbadensis Leaf (Certified Organic Filet Of Aloe Vera), Glycerin (Vegetable), Hamamelis Virginiana (made from Certified Organic Witch Hazel) Extract, Cucumis Sativus (Cucumber) Fruit Extract, Citric Acid, Citrus Grandis (Grapefruit) Seed Extract. • Alcohol-Free Witch Hazel Toner Rose Petal: Rose Petal Alcohol-Free Witch Hazel with Aloe Vera Formula Toner provides your skin glow. Rose Thayer's remarkably calming Toner is made with Rose-petal water, Vitamin E and the proprietary Witch Hazel extract. 12 oz. ORDER TODAY! Ingredients: Purified Water, Aloe Barbadensis Leaf Juice (Certified Organic Filet Of Aloe Vera), Glycerin (Vegetable), Fragrance (Natural Rose), Hamamelis Virginiana Extract (made from Certified Organic Witch Hazel), Rosa Centifolia (Rose) Flower Water, Citric Acid, Citrus Grandis (Grapefruit) Seed Extract. • Alcohol-Free Witch Hazel Toner Lavender: Lavender Alcohol-Free Witch Hazel with Aloe Vera Formula Toner rejuvenates the skin with a gentle, calming formula. Your skin will think you're at a spa. 12 oz. ORDER TODAY! Ingredients: Purified Water, Aloe Barbadensis Leaf Juice (Certified Organic Filet Of Aloe Vera), Glycerin (Vegetable), Fragrance (Natural Lavender), Hamamelis Virginiana Extract (made from Certified Organic Witch Hazel), Lavandula Angustifolia (Lavender) Flower Water, Citric Acid, Citrus Grandis (Grapefruit) Seed Extract. • Alcohol-Free Witch Hazel Toner Original: Alcohol-Free Witch Hazel with Aloe Vera Formula Toner will make your skin come alive. Thayer's original formula is made with the proprietary Witch Hazel extract. 12 oz. ORDER TODAY! Ingredients: Purified Water, Aloe Barbadensis Leaf Juice (Certified Organic Filet Of Aloe Vera), Glycerin (Vegetable), Fragrance (Natural Witch Hazel), Hamamelis Virginiana Extract (made from Certified Organic Witch Hazel), Citric Acid, Citrus Grandis (Grapefruit) Seed Extract. • Alcohol-Free Witch Hazel Toner Unscented: Alcohol-Free Unscented Witch Hazel and Aloe Vera Formula Toner contain all the replenishing, invigorating nutrients of the fragranced varieties, but are unnoticeable by the nose. You won't smell it, but you'll certainly feel it. Fragrance-Free and Hypoallergenic. 12 oz. ORDER TODAY! Ingredients: Purified Water, Aloe Barbadensis Leaf (Certified Organic Filet Of Aloe Vera), Glycerin (Vegetable), Hamamelis Virginiana (made from Certified Organic Witch Hazel) Extract, Citric Acid, Citrus Grandis (Grapefruit) Seed Extract. FACE CARE: Alcohol-Free Witch Hazel Toner, 12 oz. • Natural Facial Scrub Cocoa Butter: A calming, natural-fiber Cocoa Butter Natural Facial Scrub helps deep cleans your skin with the added benefits of pure Cocoa Butter. The gentle exfoliating action draws out impurities, unclogs pores and removes dead, dry cells from the surface of your skin. Natural Cocoa Butter helps retain moisture levels, protecting your skin from the harsh elements. Use once a week, or more often if your skin is oily, and your skin will appear renewed and healthy and feel soft and smooth. This scrub works well in the shower too! 6 oz. ORDER TODAY! Ingredients: Water, Walnut Shell Posder, Sodium Lauryl Sulfate, Stearic Acid, Cocoa Butter, Glyceryl Stearate, Stearyl Alcohol, Glycerin, Kaolin, Coamidopropyl Betaine, Isopropyl Myristate, Dimethicone, Triethanolamine, Fragrance, Carbomer 940, Propylene Glycol, Diazolidinyl Urea, Methylparaben, Propylparaben, Phenozyethanol. • Natural Facial Scrub Aloe Vera: The mild, calming, natural-fiber Aloe Vera Natural Facial Scrub helps soothe and smooth skin with Aloe Vera while gently exfoliating. The extra-gentle scrubbing action of Walnut Shell Powder removes dry skin, helps unclog pores and draws out skin impurities. Made with Aloe Vera to relax skin and add moisture, and Jojoba Oil promotes moisturization, leaving skin noticeably soft and smooth. Apply this rich scrub once a week, or more often if your skin is oily, and try using it in the shower too! 6 oz. ORDER TODAY! Ingredients: Water (Aqua), Juglans Regia (Walnut) Shell Powder, Carbomer, Sodium Lauryl Sulfate, Stearyl alcohol, Stearic Acid, Glyceryl Stearate, glycerin, Cocamidopropyl Betaine, Kaolin, Isopropyl Myristate, Dimethicone, Aloe Barbadensis Leaf Juice, Hydrogenated Jojoba Oil, Lavandula Angustifolia (Lavender) Flower/Leaf/Stem Extract, Chamomila Recutita (Matricaria) Flower Extract, Prunus Amygdalus Dulcis (Sweet Almond Oil), Prunus Amygdalus Dulcis (Sweet Almond) Seed Meal, Tocopheryl Acetate, Ascorbic Acid, Triethanolamine, Propylene Glycol, Phenoxyethanol, Diazolidinyl Urea, Methylparaben, Propylparaben, Fragrance (Parfum). • Natural Facial Scrub Mint Julep: An invigorating natural-fiber Mint Julep Natural Facial Scrub helps deep clean your skin and leaves a lovely, tingling glow. The gentle exfoliating action draws out impurities, unclogs pores and removes dead, dry cells from the surface of your skin. Emollients help retain skin moisture, efficiently protecting your skin from the harsh elements. Use once a week, or more often if your skin is oily, for skin that looks bright and healthy and feels soft and supple. This scrub works great in the shower too! 8 oz. ORDER TODAY! Ingredients: Water, Walnut Shell Powder, Sodium Lauryl Sulfate, Stearic Acid, Glyceryl Stearate, Stearyl Alcohol, Glycerin, Kaolin, Cocamidopropyl Betaine, Isopropyl Myristate, Dimethicone, Triethanolamine, Fragrance, Carbomer 940, Propylene Glycol, Diazolidinyl Urea, Methylparaben, Propylparaben, Phenoxyethanol. • Natural Facial Scrub Apricot: Enjoy a natural-fiber Apricot Natural Facial Scrub that helps exfoliate the surface layers of your skin to reveal a healthy, radiant complexion. Helps remove dead skin cells build up on the surface of your face, clogging pores, and promote natural radiance. Apricot Natural Facial Scrub helps remove this build up, leaving skin glowing, soft and smooth. Use once a week or more often if your skin is oily. Perfect for use in the shower too. 6 oz. ORDER TODAY! Ingredients: Water (aqua), Juglans Regia (Walnut) Shell Powder, Glyceryl Stearate, PEG-100 Stearate, Sodium Lauryl Sulfate, Cetyl Alcohol, Glycerin, Kaolin, Cocomidopropyl Betaine, Prunus Armeniaca (Apricot) Kernel Oil, Isopropyl Myristate, Dimethicone, Sambucus Nigra Flower Extract, Primula Veris Extract, Helianthus Annus (Sunflower) Extract, Chamomilla Recutita (Matricaria) Extract, Triethanolamine, Polysorbate 60, Carbomer, Propylene Glycol, Diazolidinyl Urea, Methylparaben, Propylparaben, Phenoxyethanol, Fragrance (Parfum), Titanium Dioxide. • Natural Facial Scrub Pomegranate & Raspberry: This delicately-fragrant Pomegranate & Raspberry Natural Facial Scrub is made with Raspberry Seeds helps exfoliate dead surface cells and impurities that dull your skin. Pomegranate Oil adds antioxidant protection against the environment's skin-aging effects, and the seeds gently uncover fresher, more glowing skin with replenished shine. This luxurious, Paraben-free scrub helps purify skin's texture and retain vital moisture balance, leaving your face feeling brilliantly soft and smooth. Use once a week or more often if your skin is oily. Perfect for use in the shower. 6 oz. tube. ORDER TODAY! Ingredients: Water (Aqua), Juglans Regia (Walnut) Shell Powder, Stearic Acid, Stearyl Alcohol, Glyceryl Stearate, Keolin, Sodium Lauryl Sulfate, Rubus Idaeus (Raspberry) Seed, Punica Granatum (Pomegranate) Fruit Extract, Dimethicone, Cocamidopropyl Betaine, Triethanolamine, Sorbitol, Carbomer, Phenoxyethanol, Potassium Sorbate, Sodium Benzoate, Fragrance, Red 33 (Cl 17200). • Natural Facial Scrub Oatmeal 'n Honey: The mild, cleansing, natural-fiber Oatmeal 'n Honey Natural Facial Scrub with calming Oatmeal and Honey helps remove dull skin layers to expose your healthy complexion. The exfoliating action of the Oatmeal helps lift off impurities, unclogs pores and removes dry, dead cells from the surface of your skin. Pure, wholesome Honey helps retain moisture balance and protects your skin from the harsh elements. Your skin will look renewed and healthy and feel soft and smooth. Use once a week or more often if your skin is oily. Ideal to use in the shower too! 6 oz. tube. ORDER TODAY! Ingredients: Water, Walnut Shell Powder, Sodium Lauryl Sulfate, Stearic Acid, Oatmeal, Honey, Glyceryl Stearate, Stearyl Alcohol, Glycerin, Kaolin, Cocamidopropyl Betaine, Isopropyl Myristate, Dimethicone, Triethanolamine, Fragrace, Carbomer 940, Propylene Glycol, Diazolidinyl Urea, Methylparaben, Propylparaben, Phenoxyethanol. FACE CARE: Natural Facial Scrub, 6 oz. • Peel Off Masque Grape Seed: Grape Seed Peel Off Masque is made with Grape Seed Extract to clean and perfect your skin. Minutes after application, Grape Seed Peel Off Masque dries to a peelable film that lifts and draws out impurities from the clogged pores, softens facial lines, calm and Tones skin. After the peel, your face will feel clean with revitalized, younger-looking skin. 6 oz. tube. ORDER TODAY! Ingredients: Water, SD Alcohol 40, Polyvinyl Alcohol, Propylene Glycol, PEG-75, Grapeseed Extract, Glycerin PPG-12 PEG-65 Lanolin Oil, Benzophenone-4, Disodium EDTA, Diazolidinyl Urea, Fragrance, Ext, D&C Violet #2, D&C Yellow #33. • Masque Olive Oil: The creamy, deeply-relaxing Olive Oil Masque soaks dry skin in the healthy, moisture-replenishing richness of Olive Oil to rejuvenate and renew your appearance. A blend of Chamomile and Sage extracts help calm and relax irritation while the masque plumps skin to recondition softness, suppleness and elasticity. Helping to revitalize skin's energy and healthy radiance, the Paraben-free Olive Oil Masque leaves your ultra-dry skin feeling calmed, nurtured and silky smooth. 6 oz. tube. ORDER TODAY! Ingredients: Water (Aqua), Glyceryl Stearate, Stearyl Alcohol, Paraffinum Liquidum (Mineral Oil), Lanolin Oil, Sodium Lauryl Sulfate, Olea Europaea (Olive) Fruit Oil, Persea Gratissima (Avacado) Oil, Olea Europaea (Olive) Leaf Extract, Chamomilla Recutita (Matricaria) Flower Extract, Salvia Officinalis (Sage) Leaf Extract, Glycerin, Propylene Glycol, Disodium EDTA, Phenoxyethanol, Potassium Sorbate, Sodium Benzoate, Fragrance (Parfum), Chromium Oxide Green (Cl 77288). • Facial Masque Avocado & Grapefruit: This exclusive, gel-clay Avocado & Grapefruit Facial Masque helps gently lifts away impurities while stabilizing skin's natural balance. It's supplemented with nurturing Avocado to deliver moisture and antioxidant Grapefruit Extract to help protect and refresh tired skin. Get your skin ultra-clean, satiny-smooth and firmed. Avocado Grapefruit Masque is Paraben-free and a necessary treat to revitalize normal skin. 6 oz. tube. ORDER TODAY! Ingredients: Water (Aqua), Kaolin, Bentonite, Zinc Oxide, Sorbitol, Persea Gratissima (Avocado) Fruit Extract, Citrus Grandis (Grapefruit) Peel Extract, Glycerin, Propylene Glycol, Phenoxyethanol, Potassium Sorbate, Sodium Benzoate, Fragrance (Parfum), Yellow 5 (Cl 19140), Yellow 6 (Cl 15985). • Mud Pack Masque Natural English Clay: Mud Pack Masque is the original old-fashioned, time-tested earth facial treatment with imported natural English Clay helps clean pores, tightens loose, sagging skin on your face and neck and reduces tired facial muscles to soften lines and wrinkles. Mud Pack Masque facial helps you look your finest when you're preparing to go out for an evening or help you relax before going to bed. With use, your complexion will have a vibrant, even, and more youthful looking appearance. 8 oz. tube. ORDER TODAY! Ingredients: Distilled Water, Kaolin, Bentonite, Glycerin, Zinc Oxide, Propylene Glycol, Iron Oxides, Fragrance, Methylparaben. FACE CARE: Facial Masque, 6 oz.